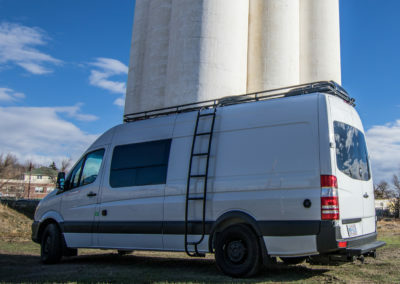 Vans and stories from the newest members of the Rossmönster family. 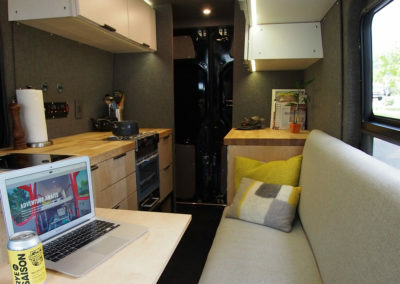 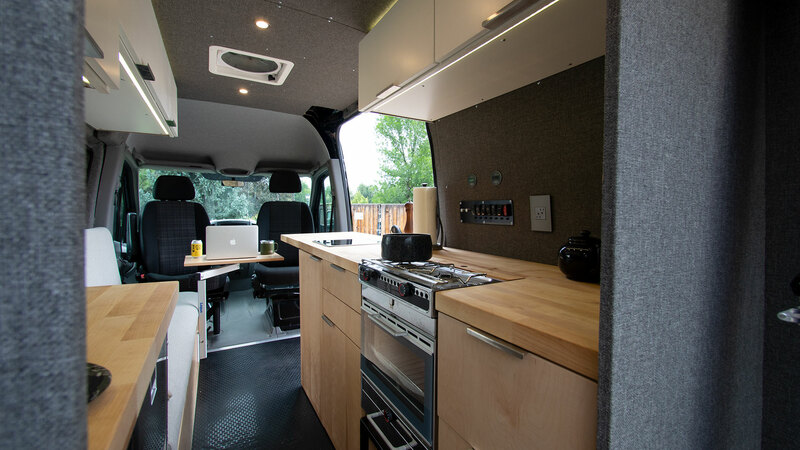 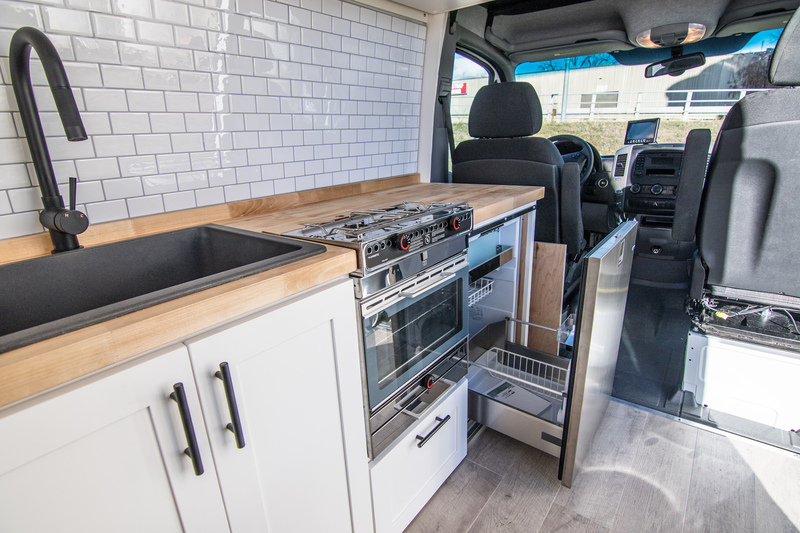 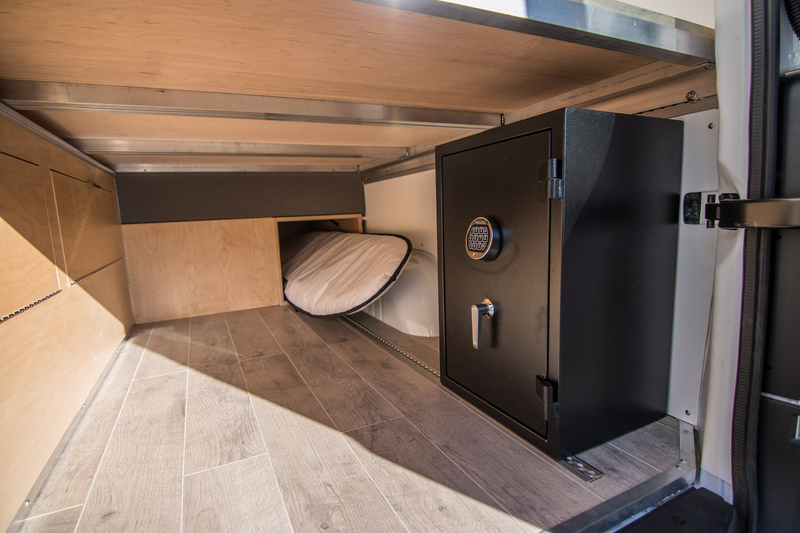 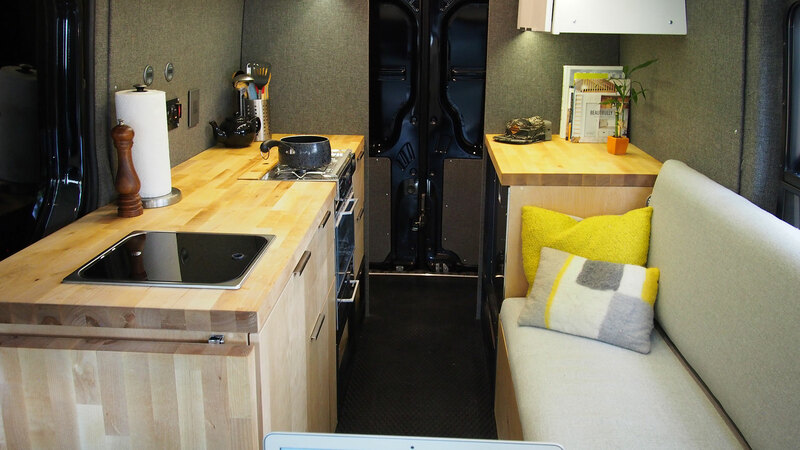 Goal: Sleeps two, kitchen with an oven, versatile gear storage, room to entertain friends. 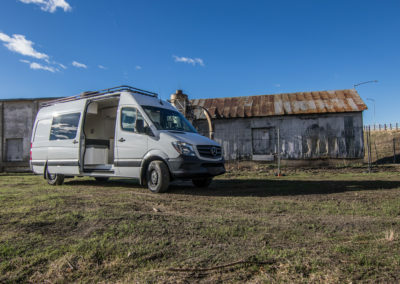 Story: Zach and Kasey are avid surfers and traveling wedding photographers. 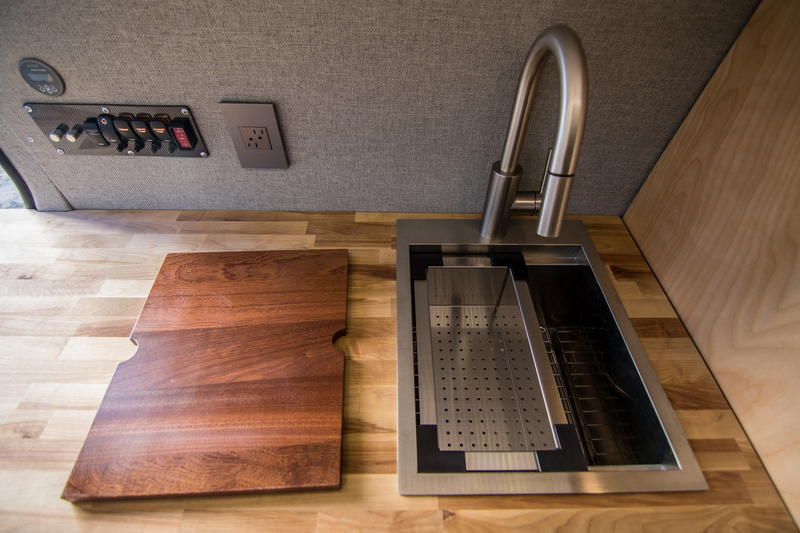 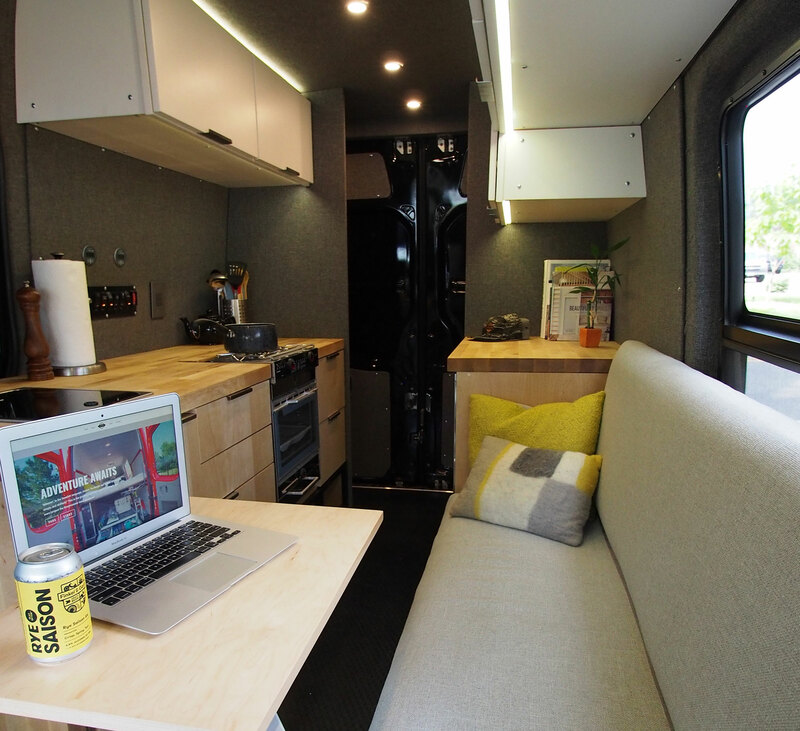 They wanted to simplify their living situation to maximize adventures. 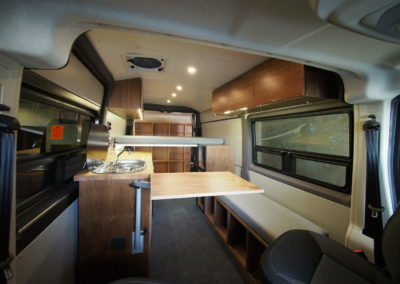 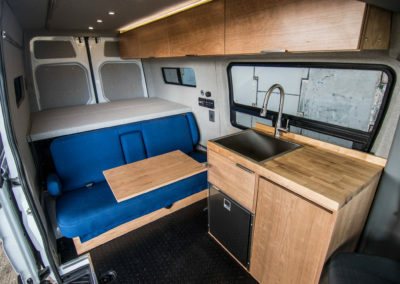 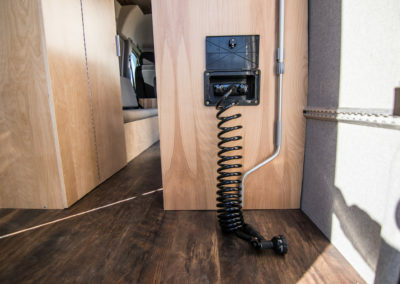 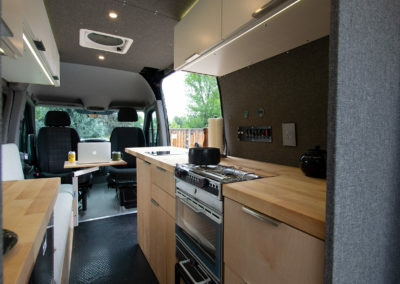 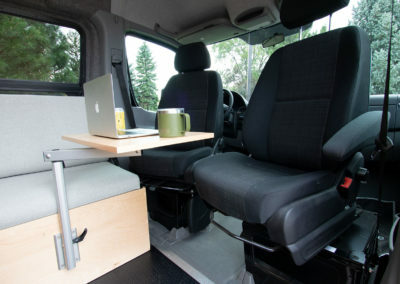 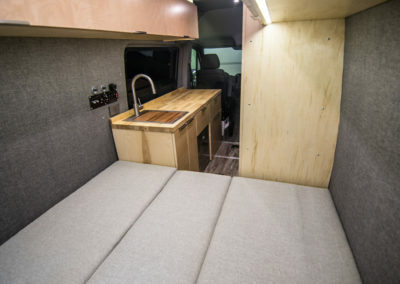 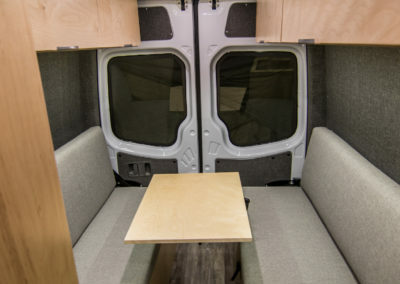 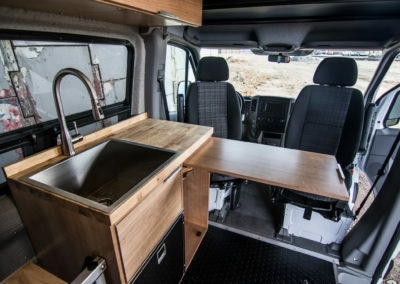 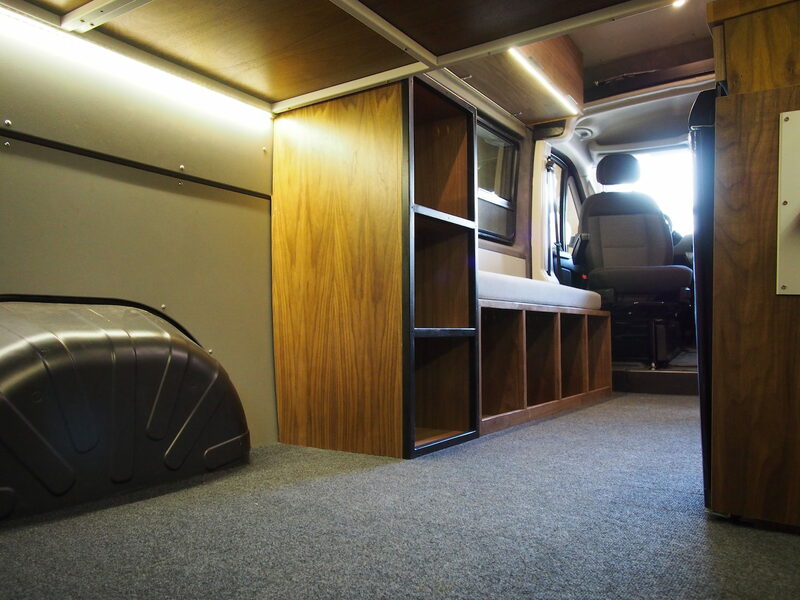 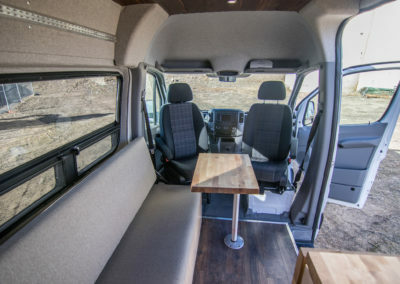 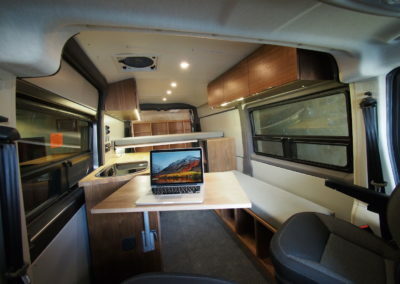 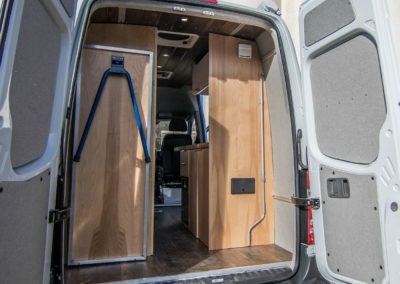 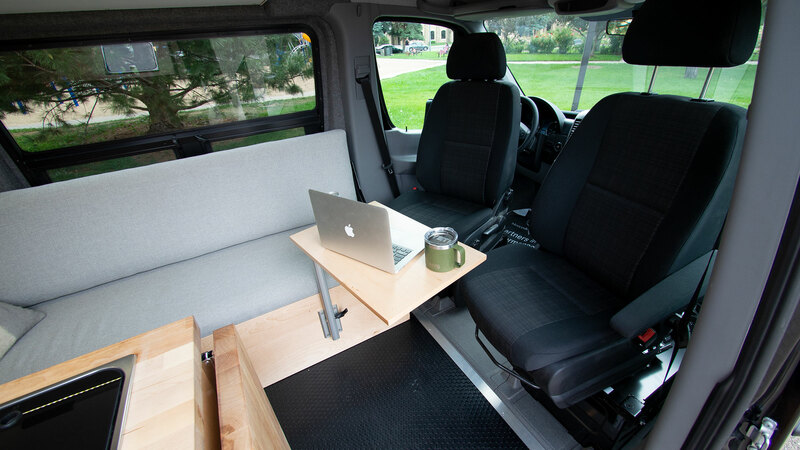 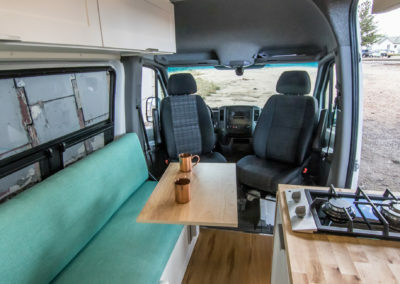 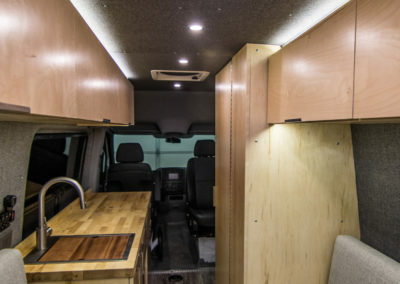 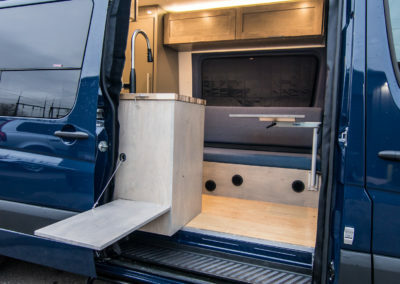 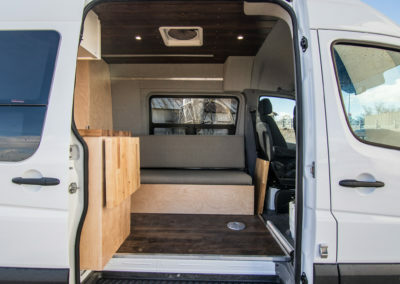 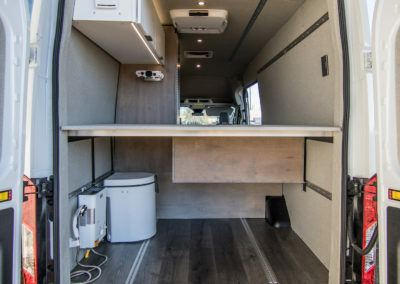 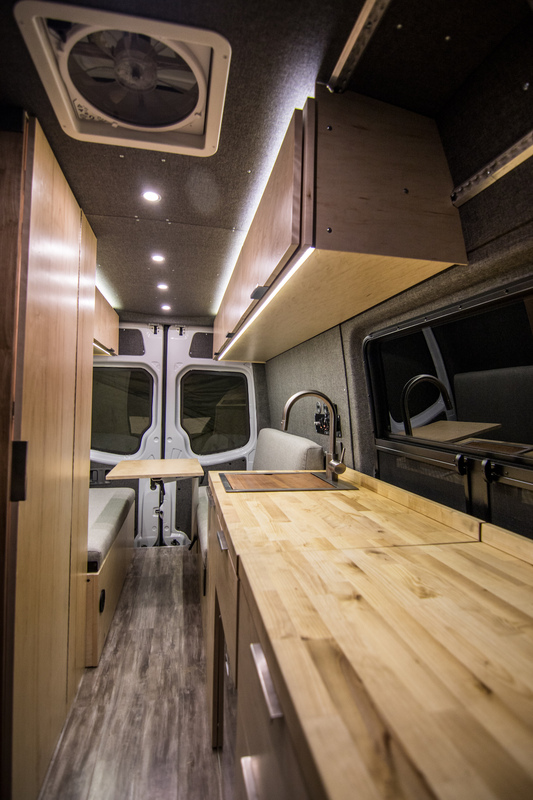 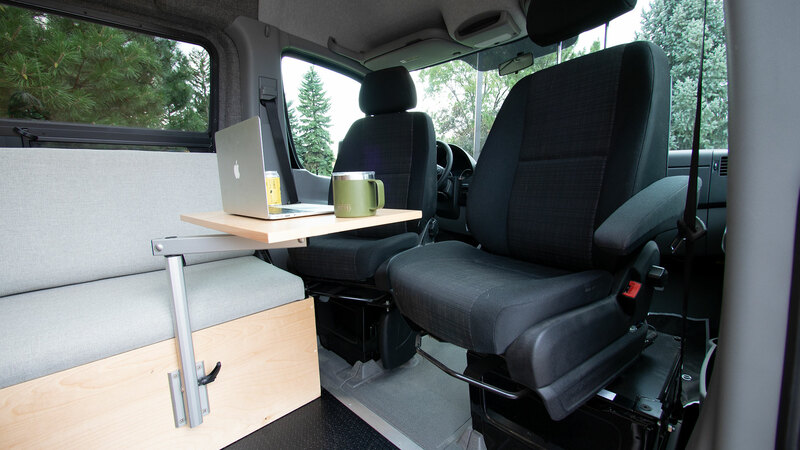 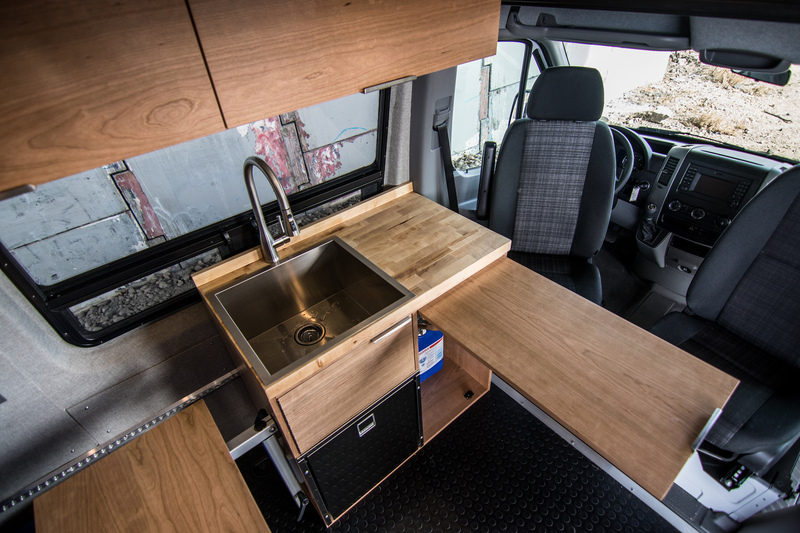 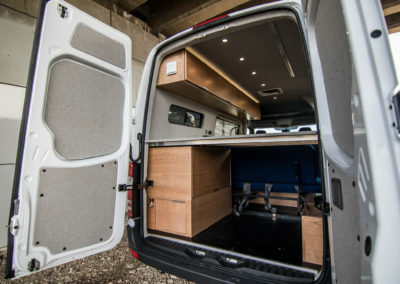 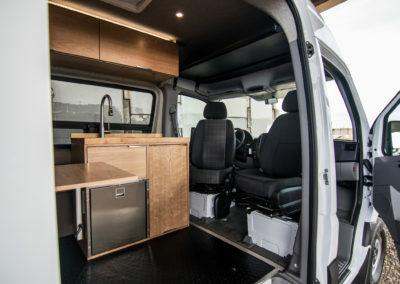 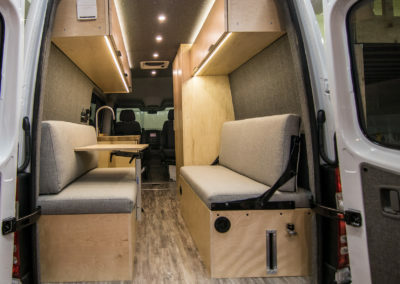 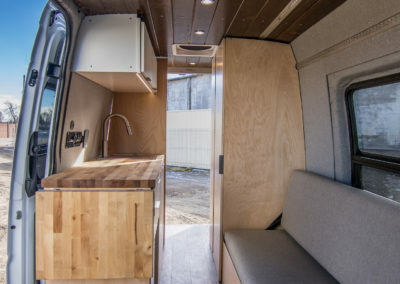 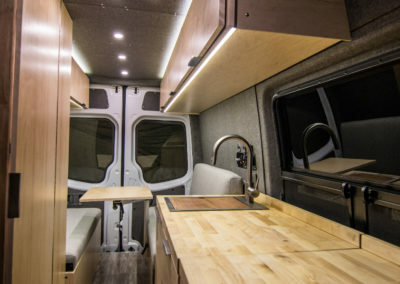 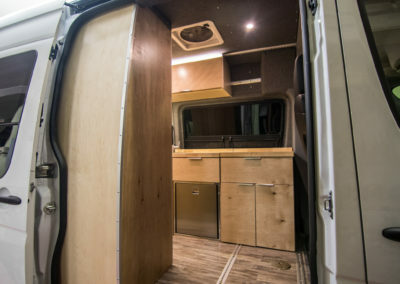 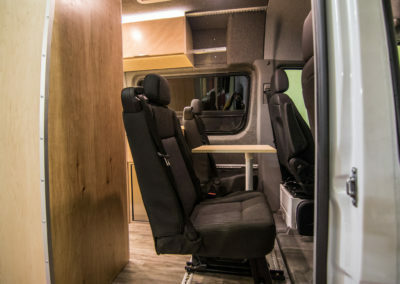 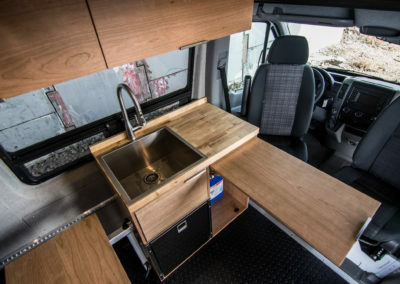 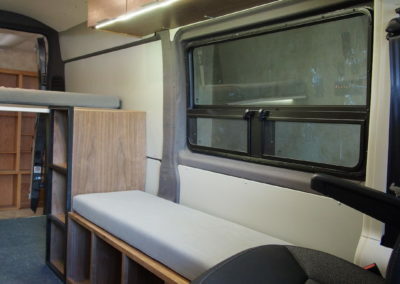 Goal: Eye-catching, functional, and comfortable for full-time vanlife. 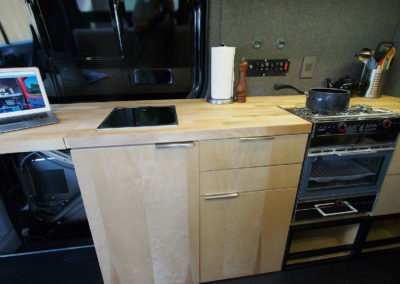 Solution: 170” Sprinter, raised bed, stove and oven, AC, white walls and cabinetry, and a custom roof rack. Story: Klaus and Kelly wanted their van to be as stylish and fashionable as they are. 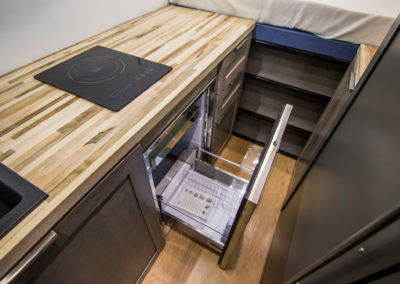 Cooking, freedom, and adventure are high priorities for these two. 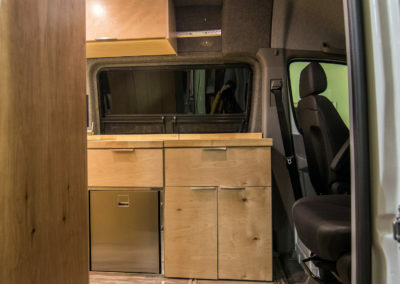 Goal: Spacious kitchen, large fridge, private bathroom, and gear storage. 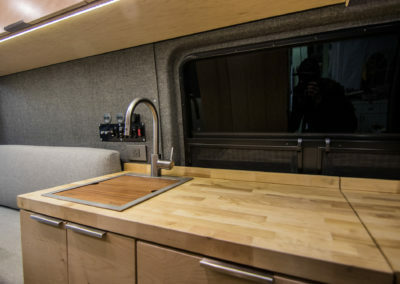 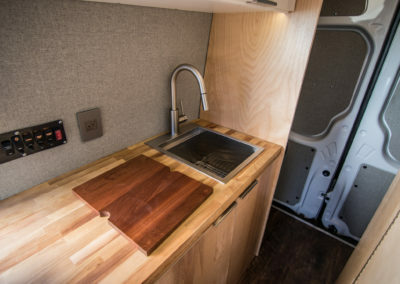 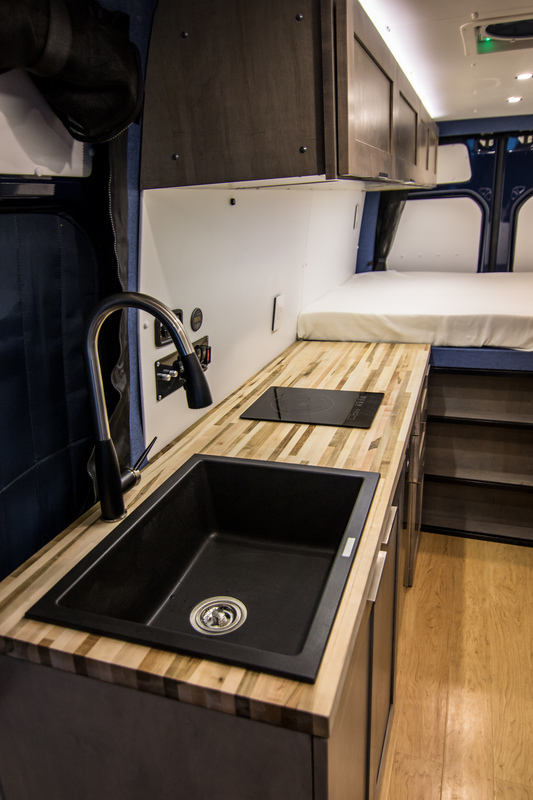 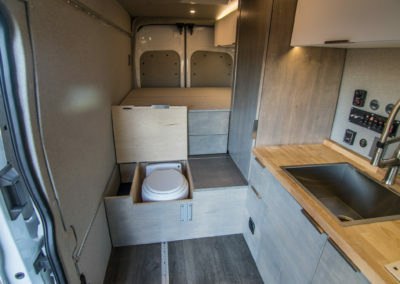 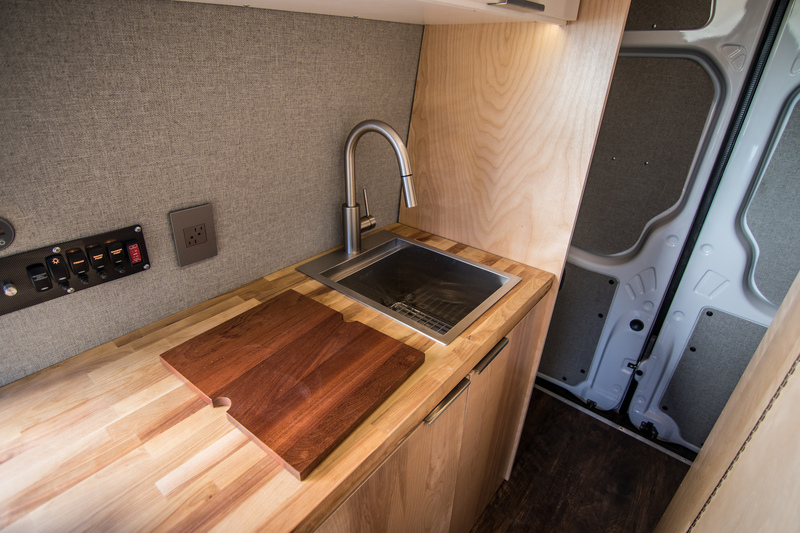 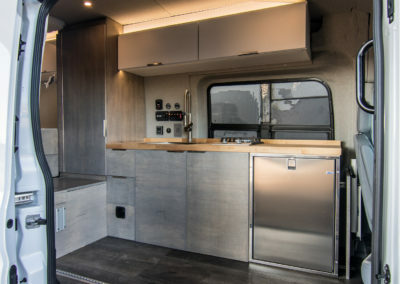 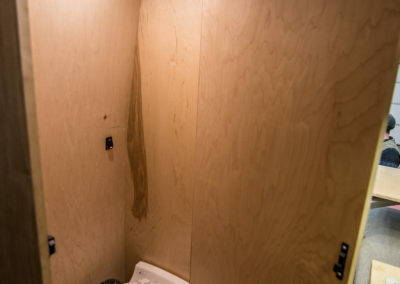 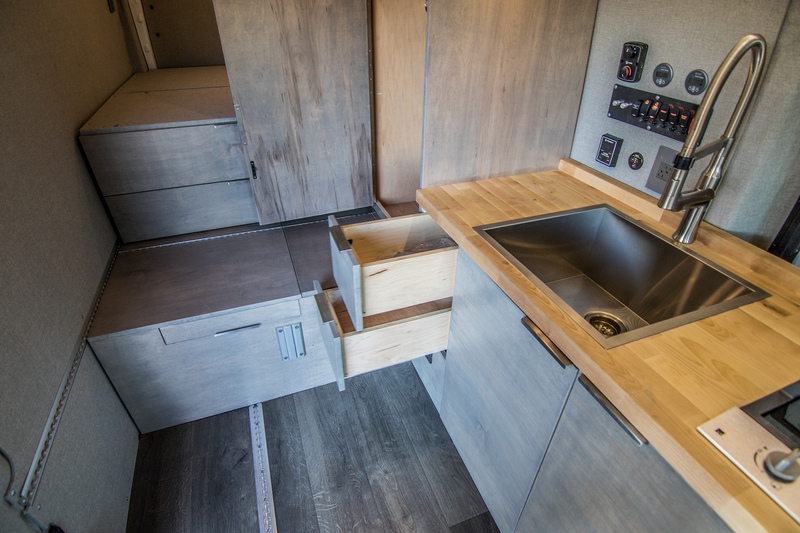 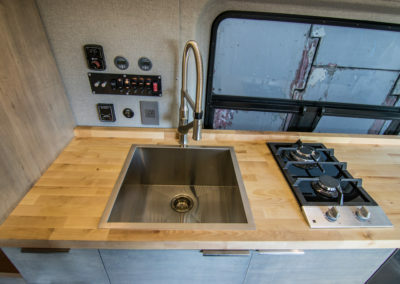 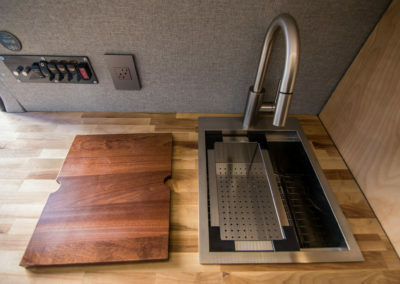 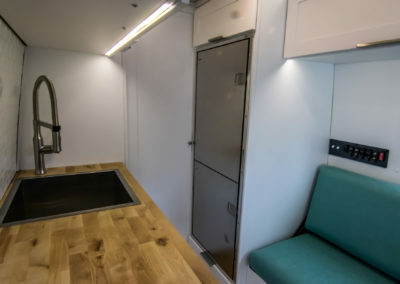 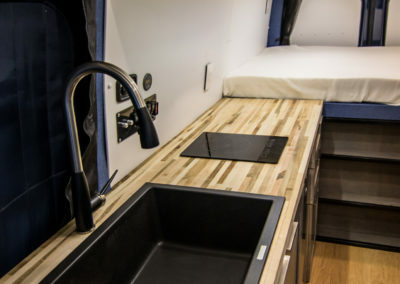 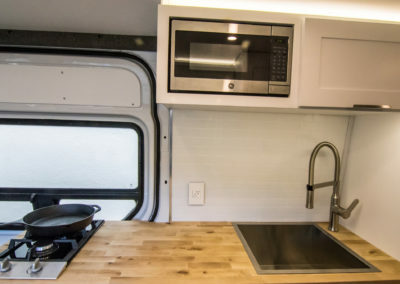 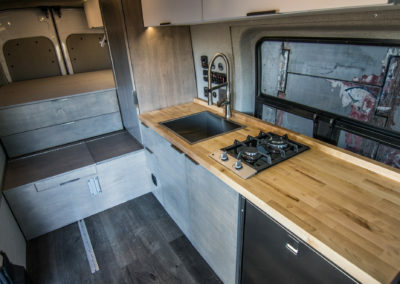 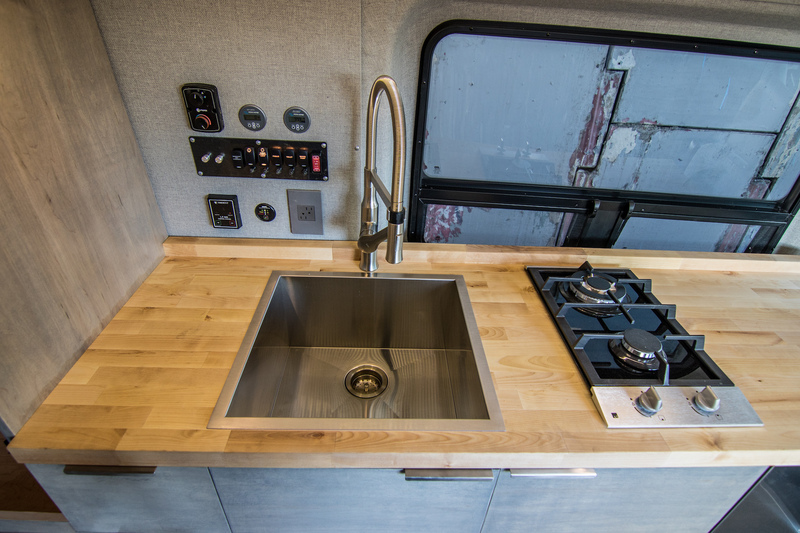 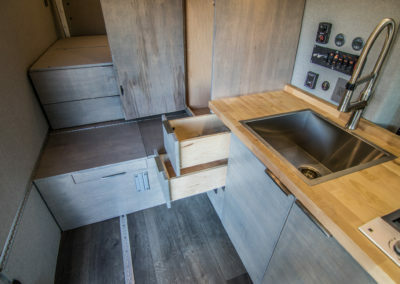 Solution: 144” Sprinter, convertible bench/bed, deep sink, large fridge, flip up countertop extension, microwave, and private bathroom with a Dry Flush toilet and sink. Story: Julie wanted a rig worthy of the weekend adventures to come. 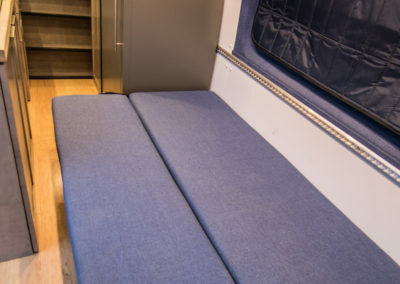 She also loves to bring her kids and friends along, so extra seating was a must. 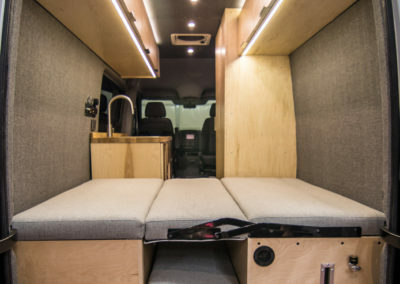 Goal: Seat five, sleep four, small kitchen, and gear storage. 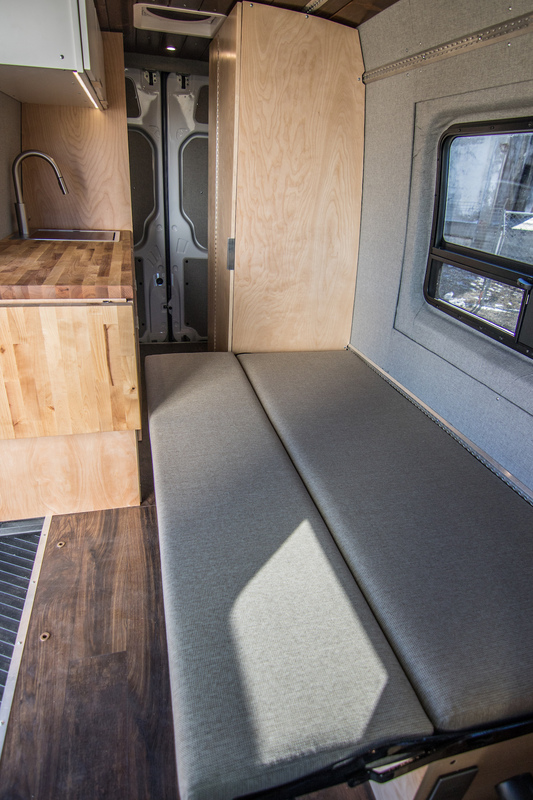 Solution: 144” Sprinter, raised bed, DOT approved bench that converts into a bed, and a tons of garage storage. 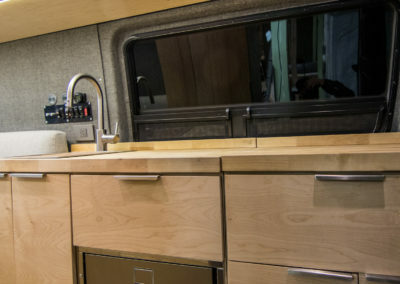 Story: Rochelle is passionate about helping people and being in the outdoors. 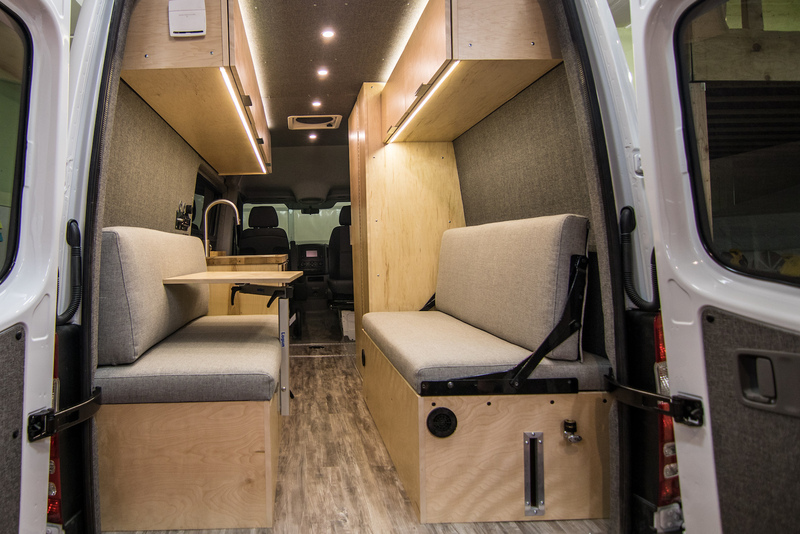 With the goal of providing therapy in nature, she decided to pack up and make her business mobile. 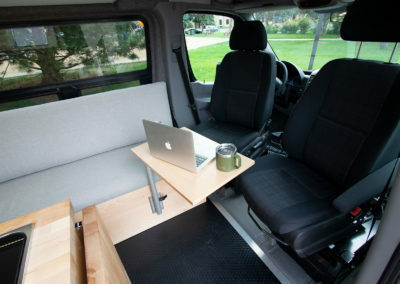 Goal: Inviting and comfortable sitting area, open floor plan, and easy access to an outdoor living area. 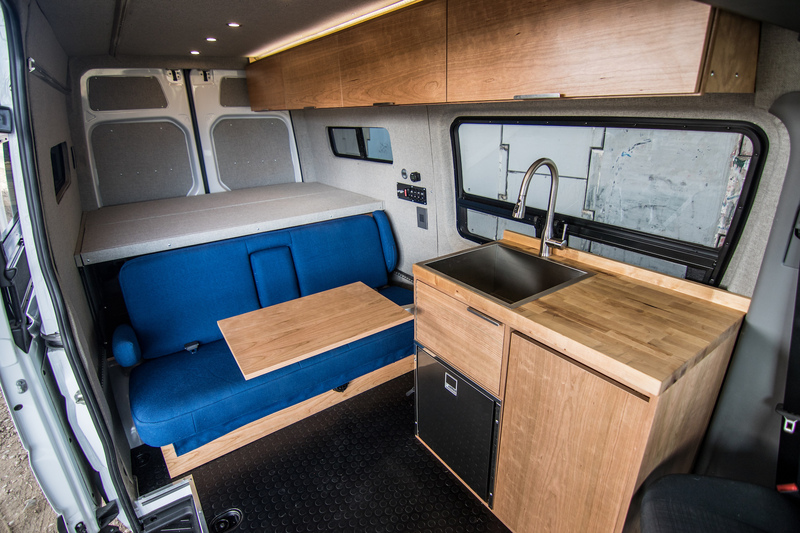 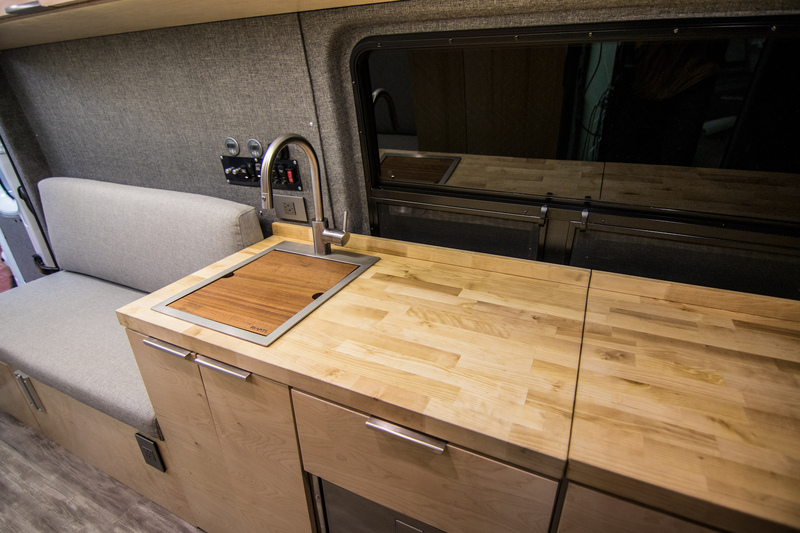 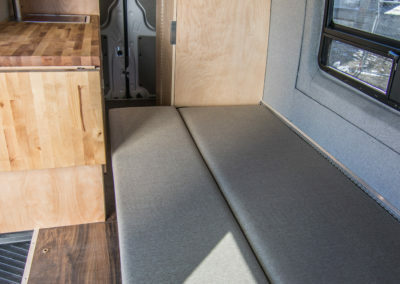 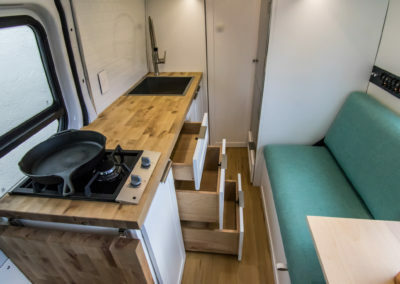 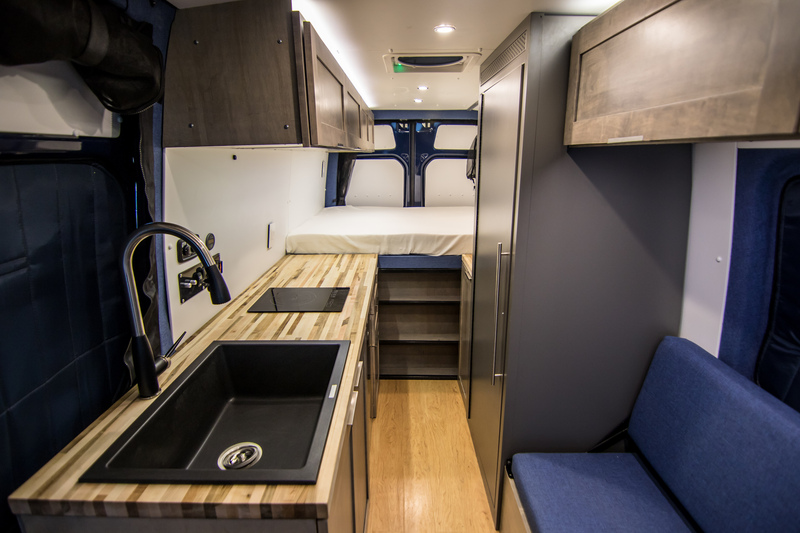 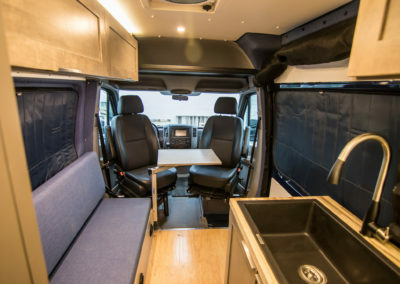 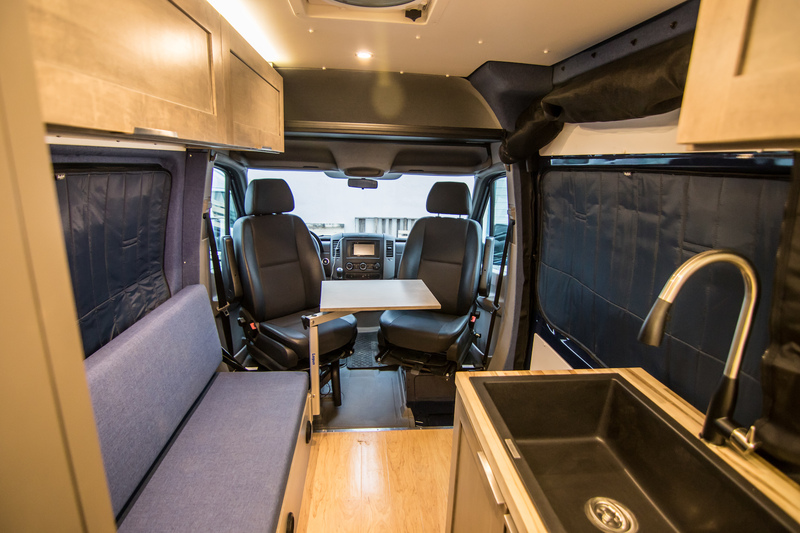 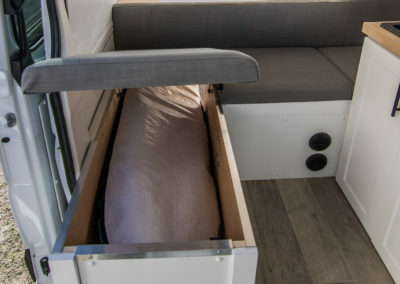 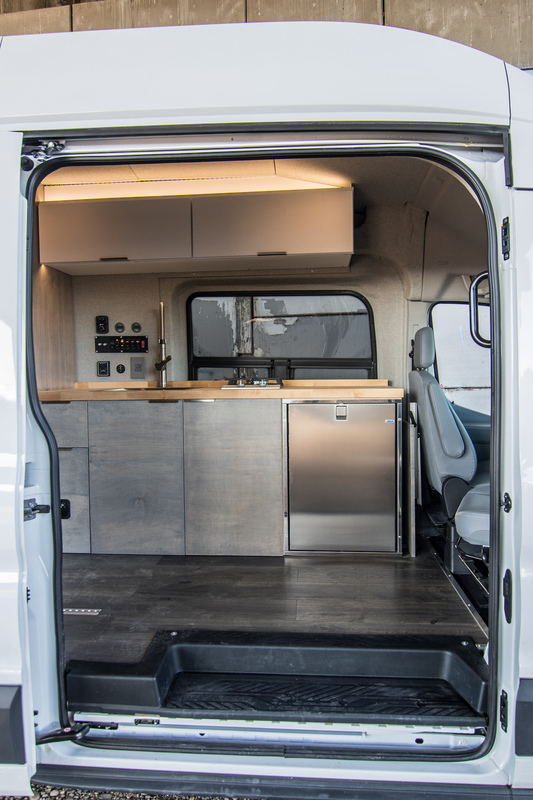 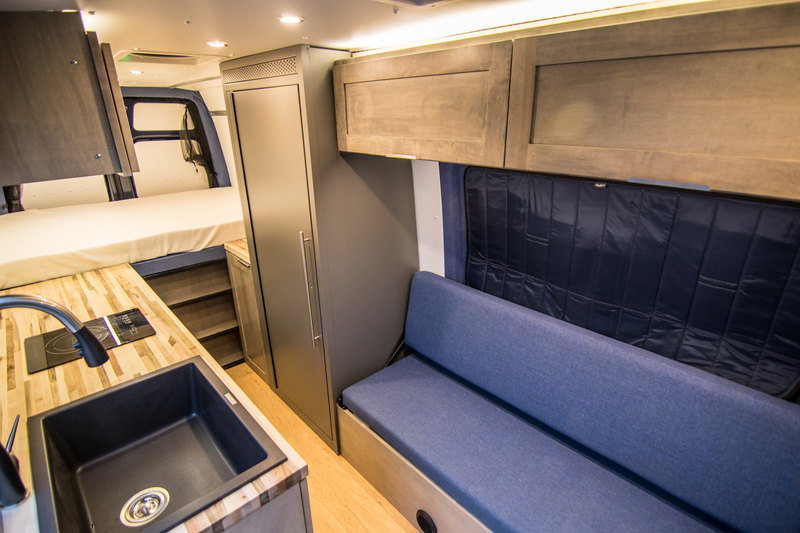 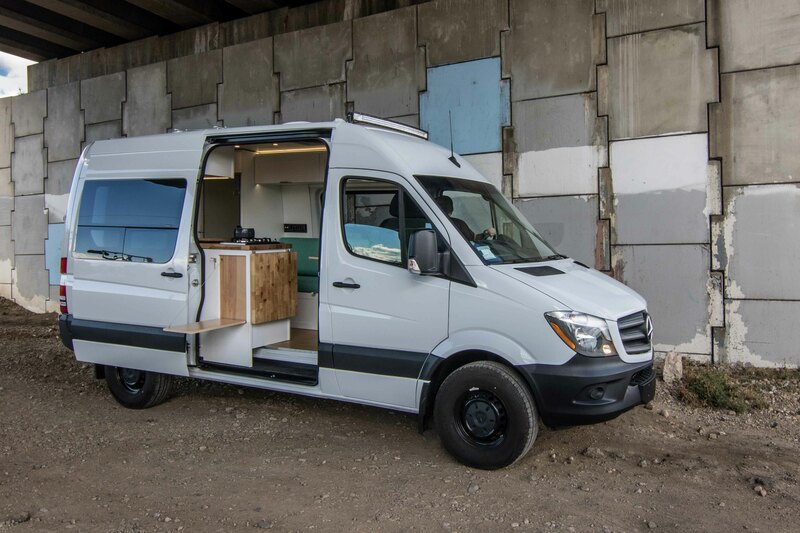 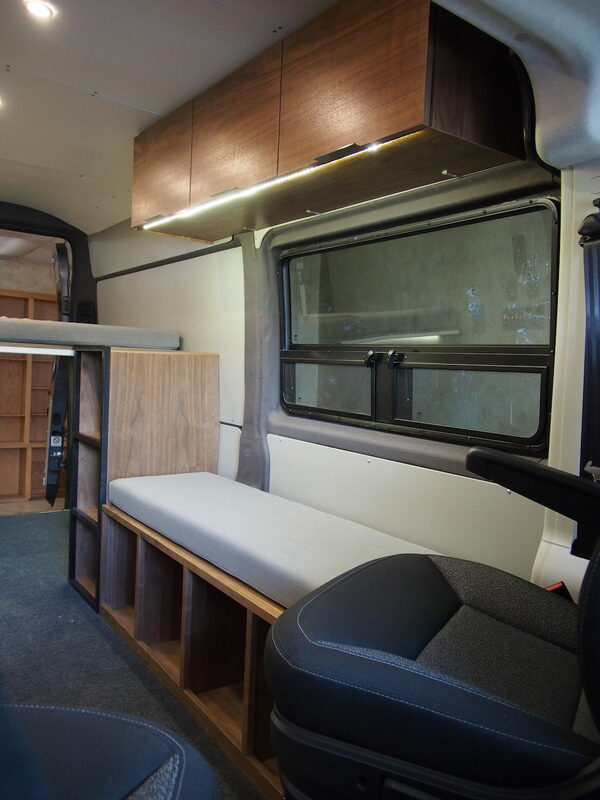 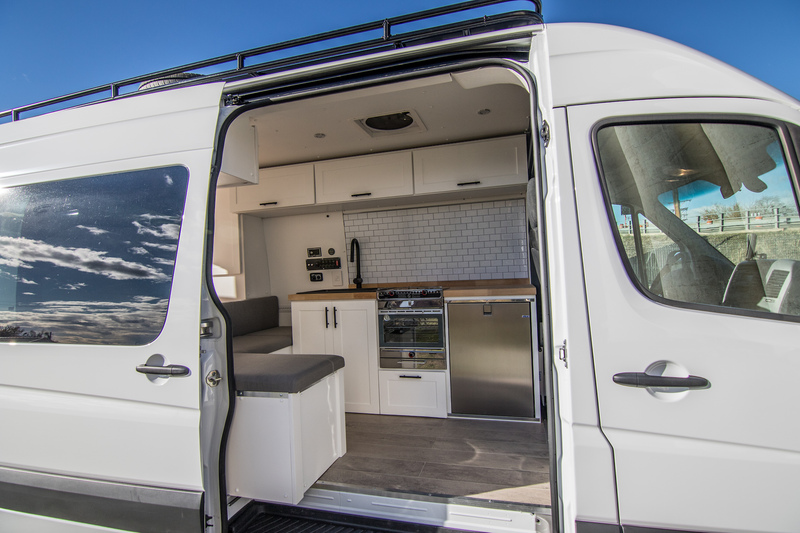 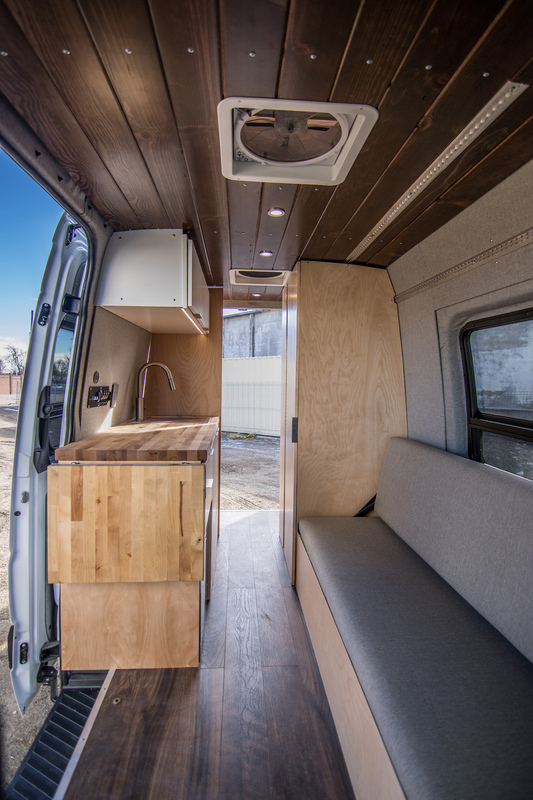 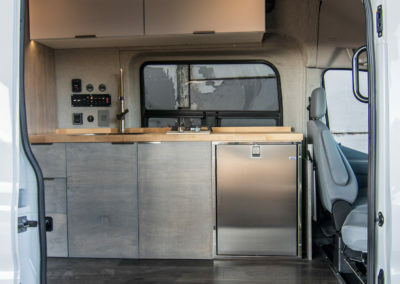 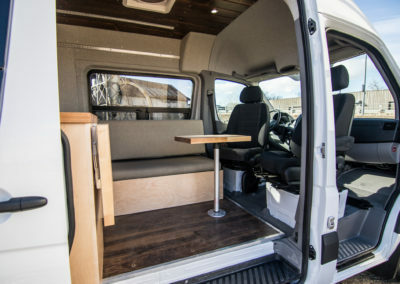 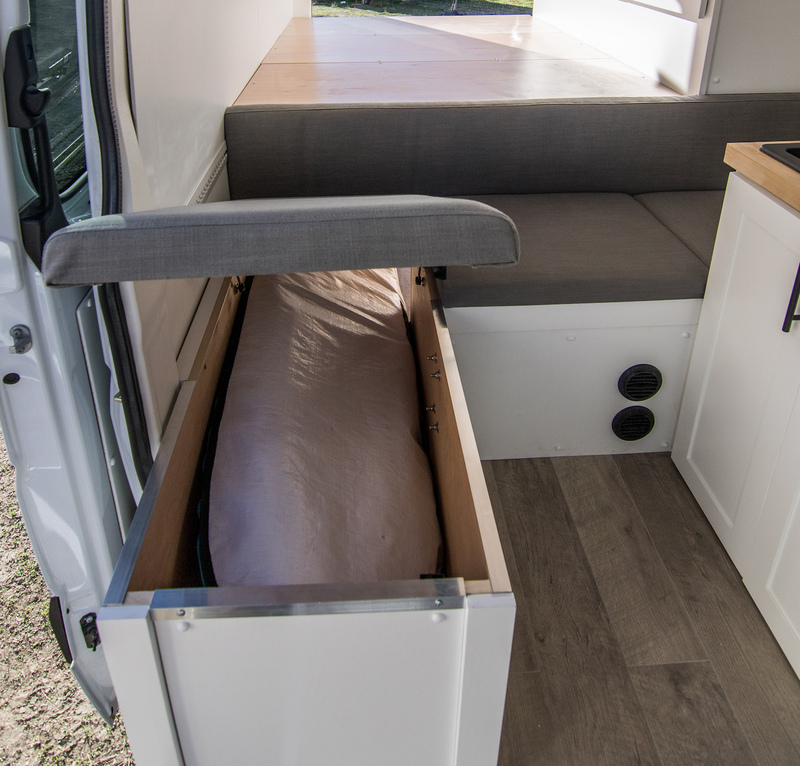 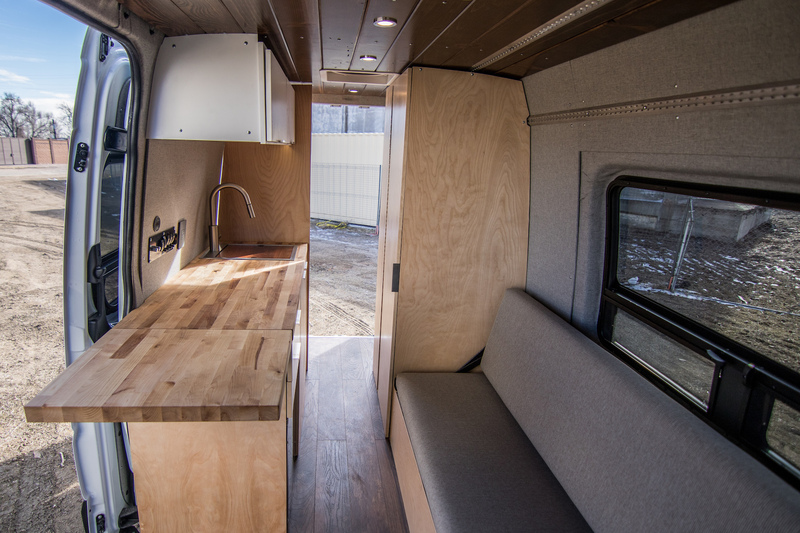 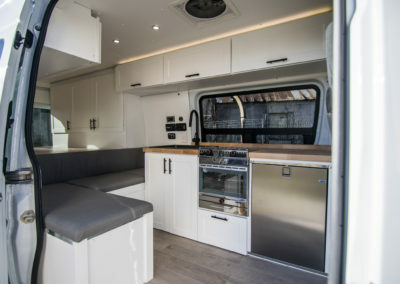 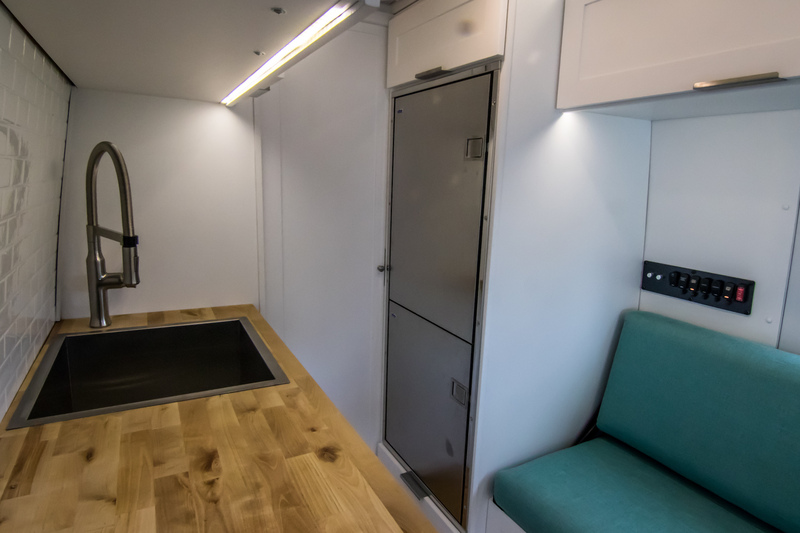 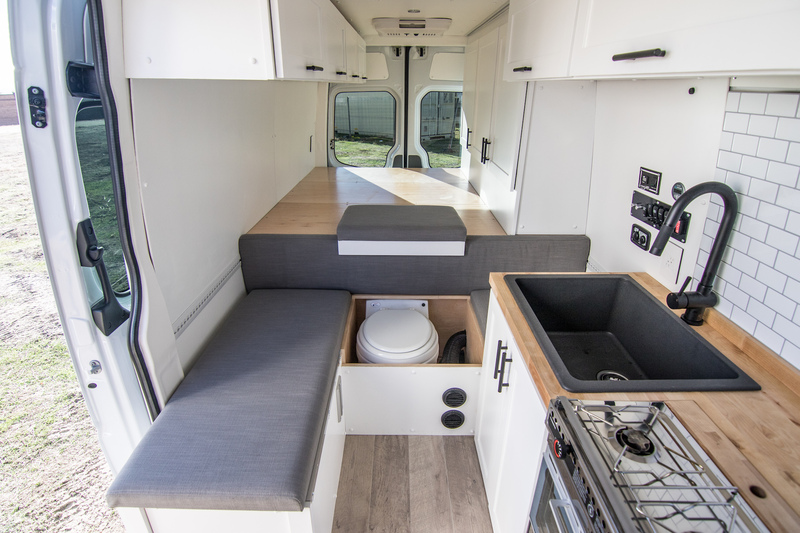 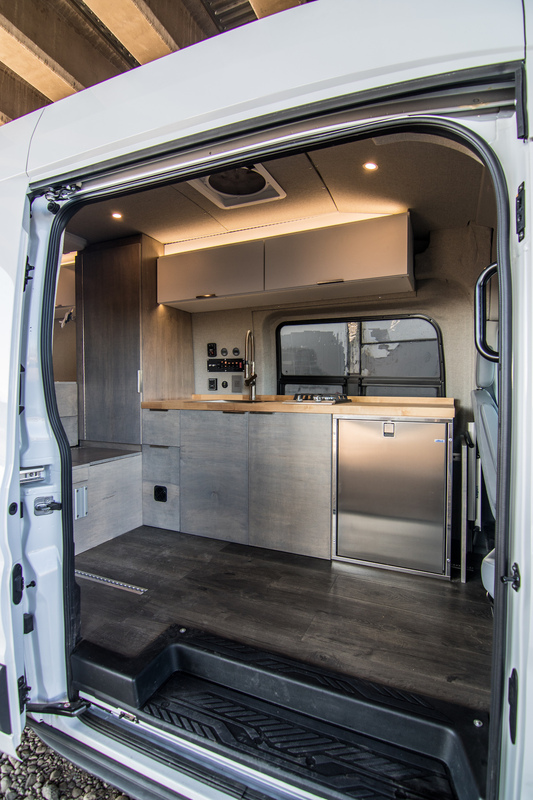 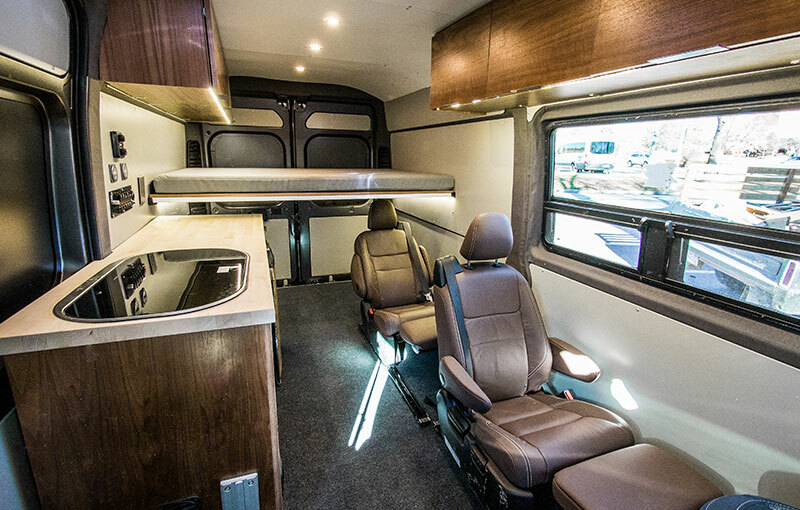 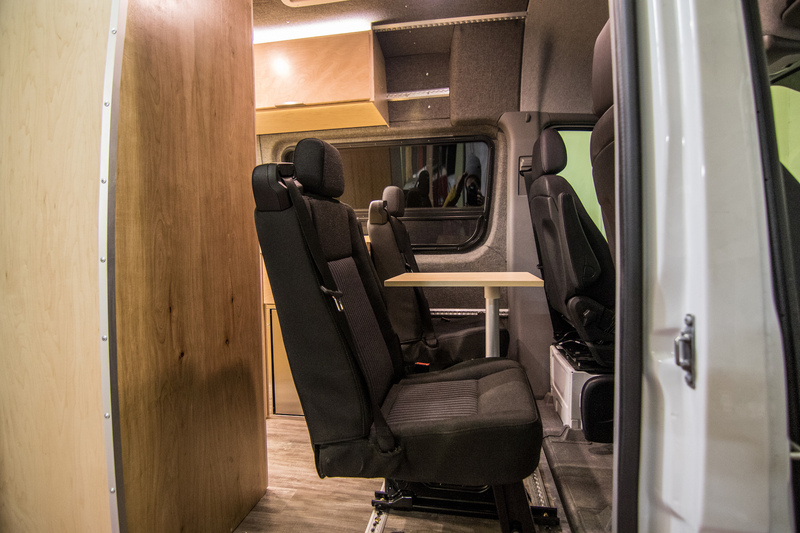 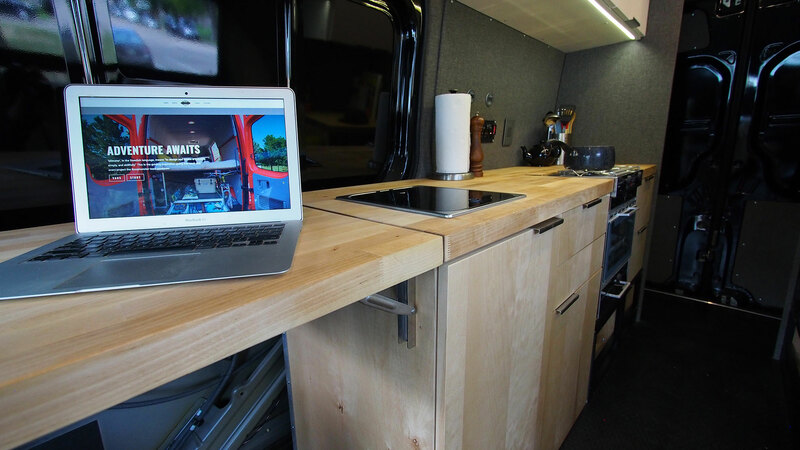 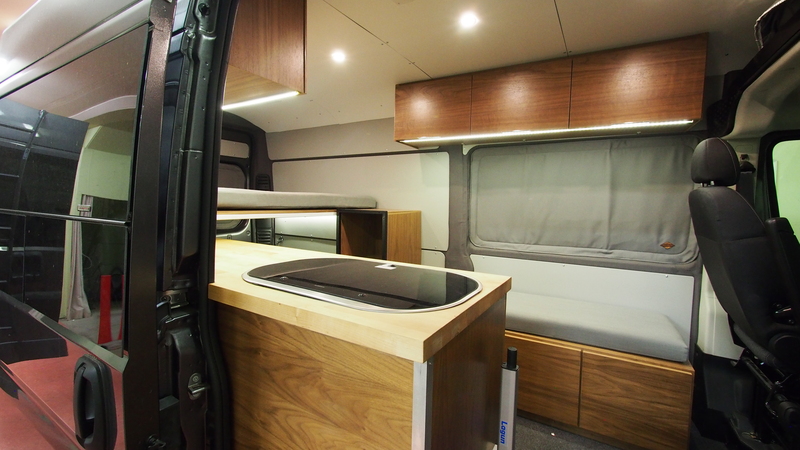 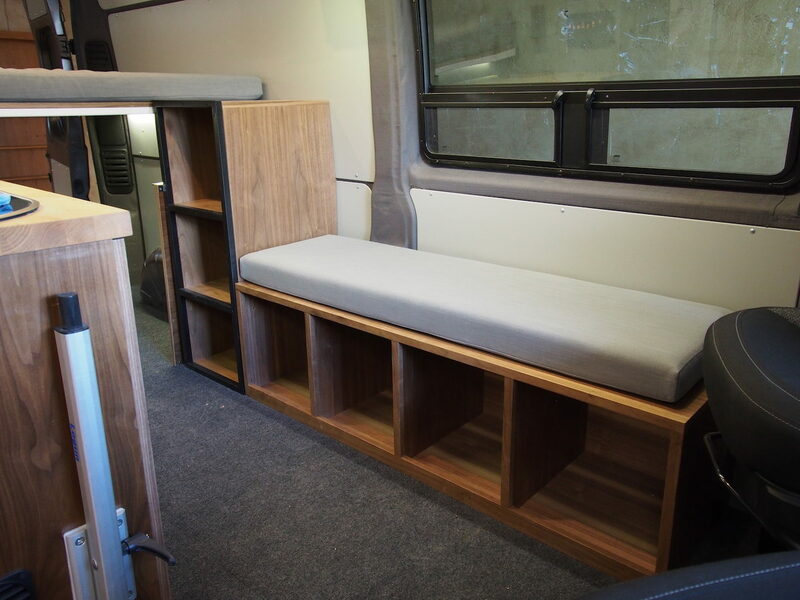 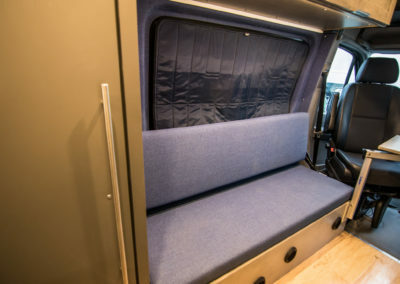 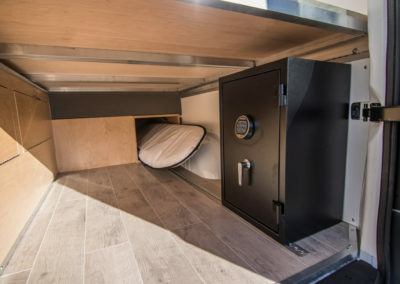 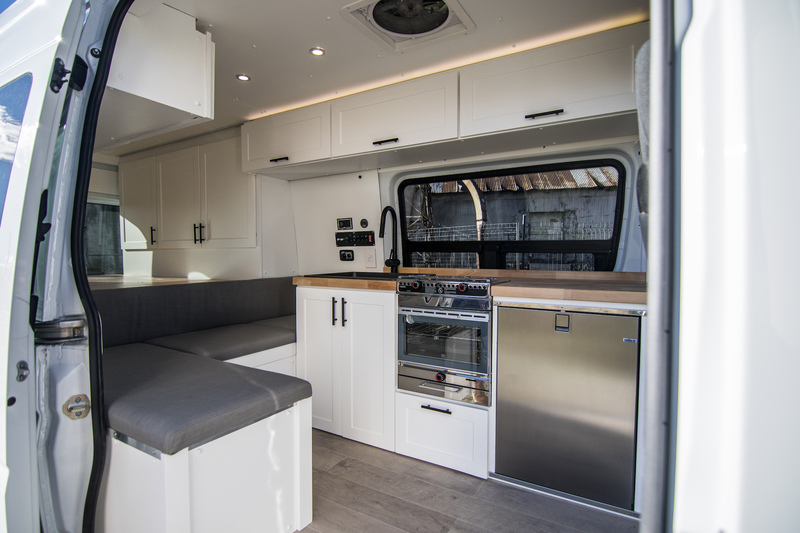 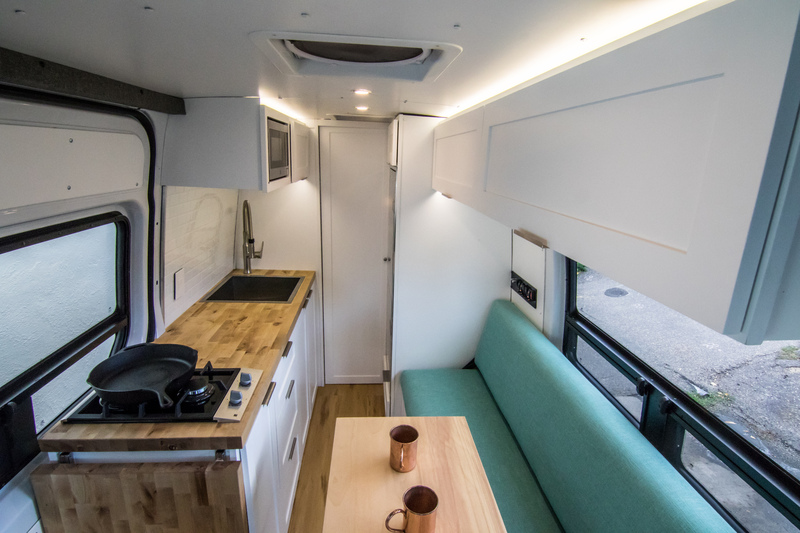 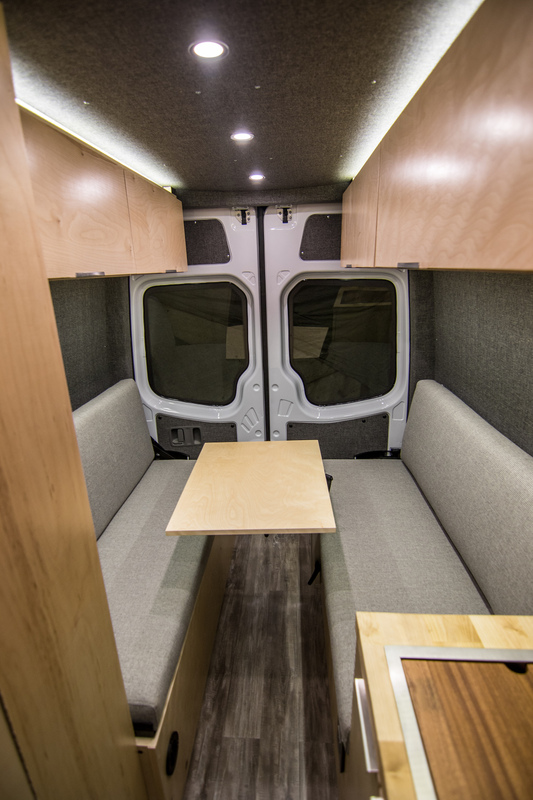 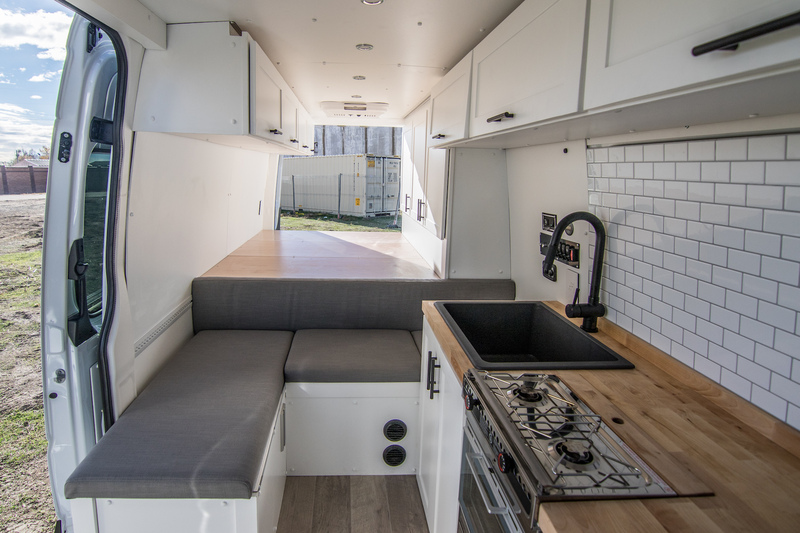 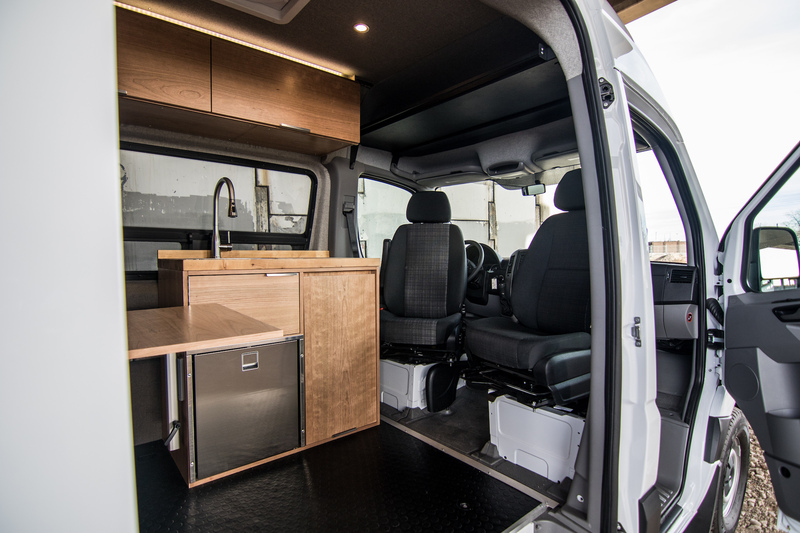 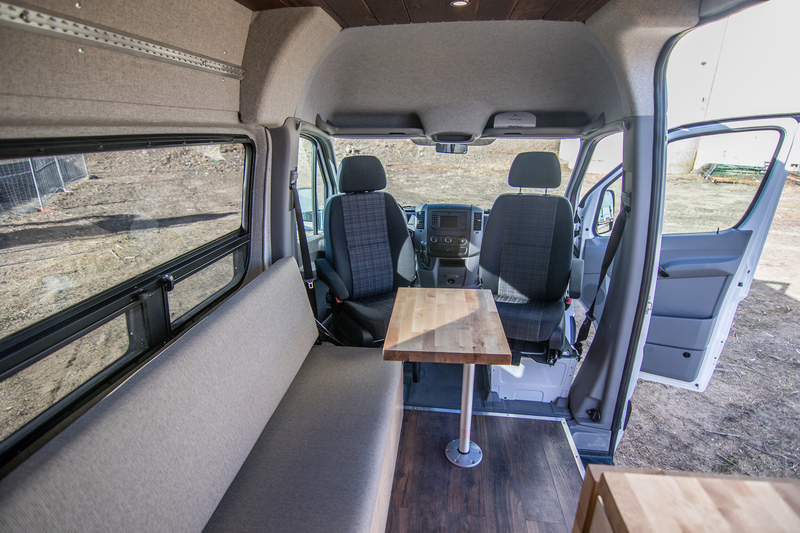 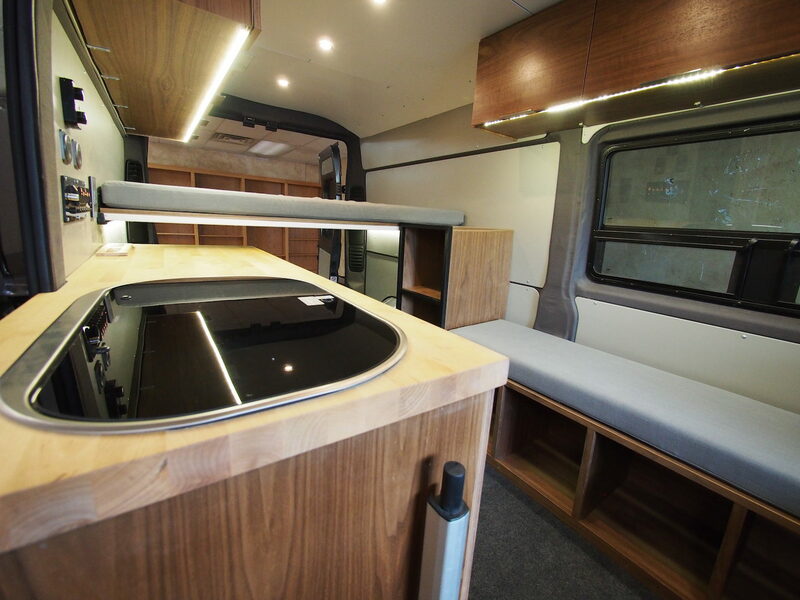 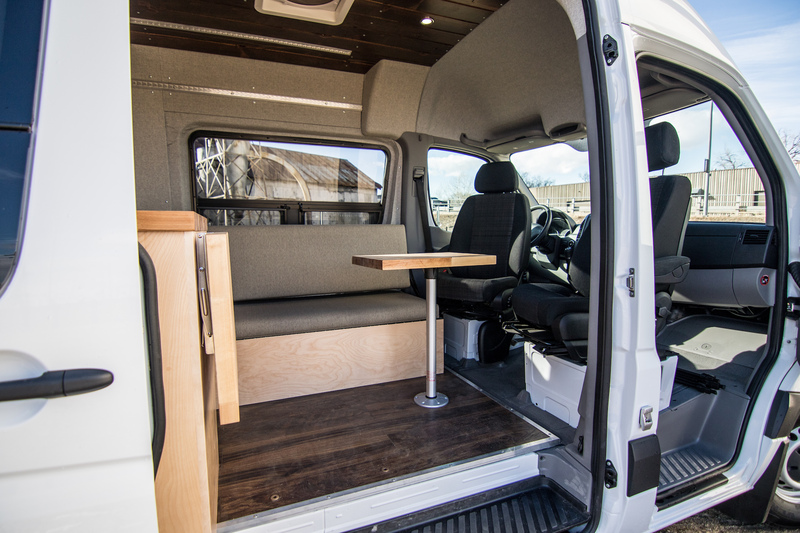 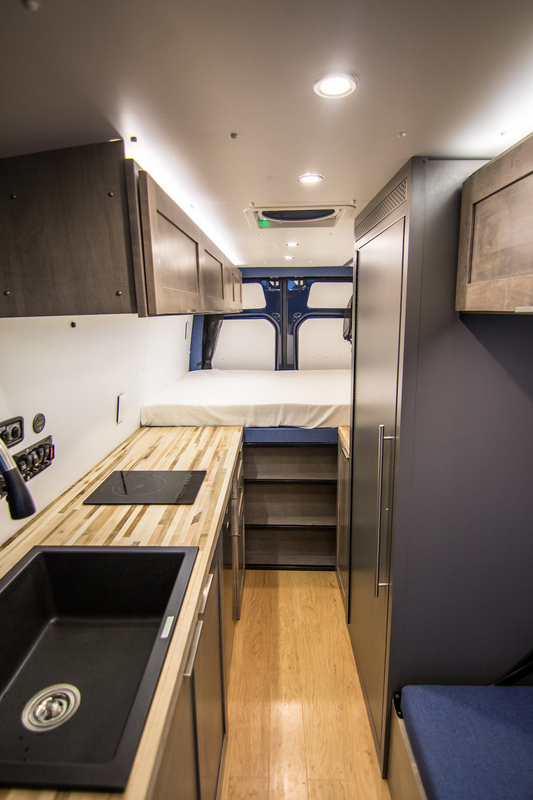 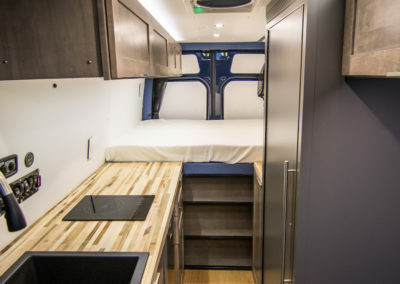 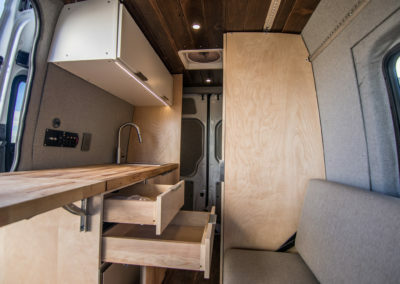 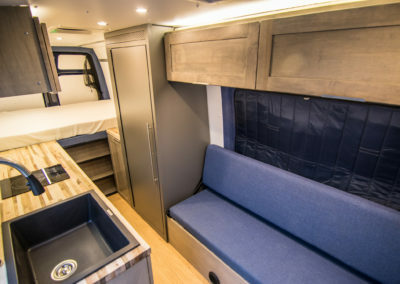 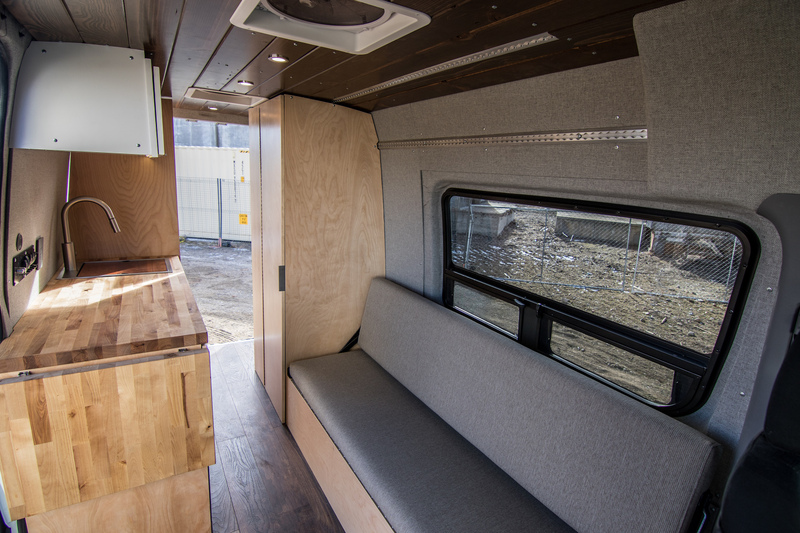 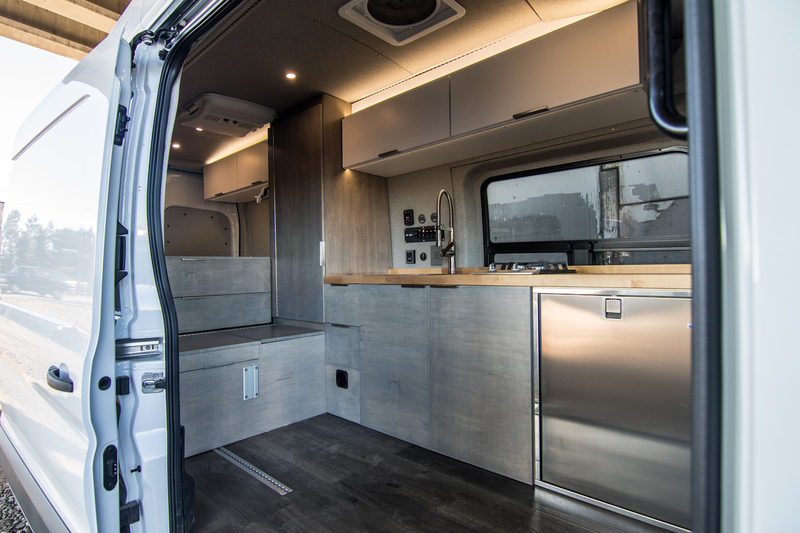 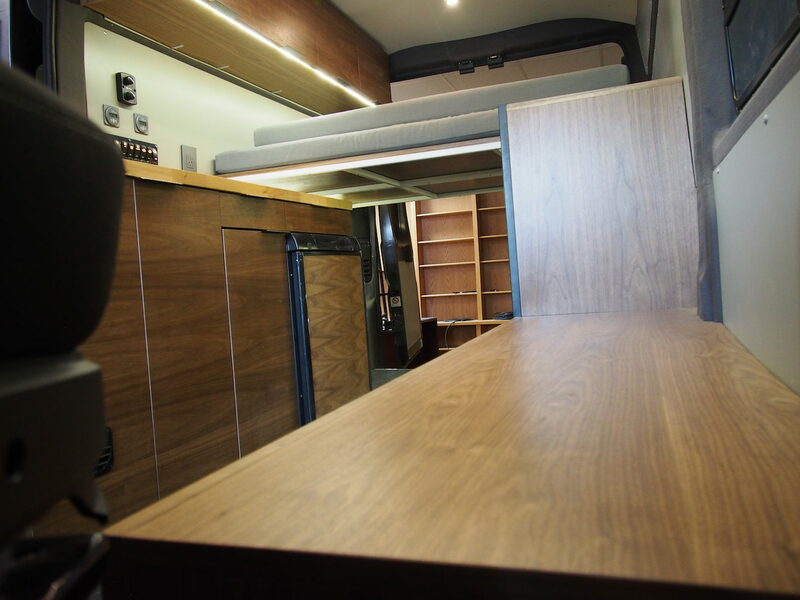 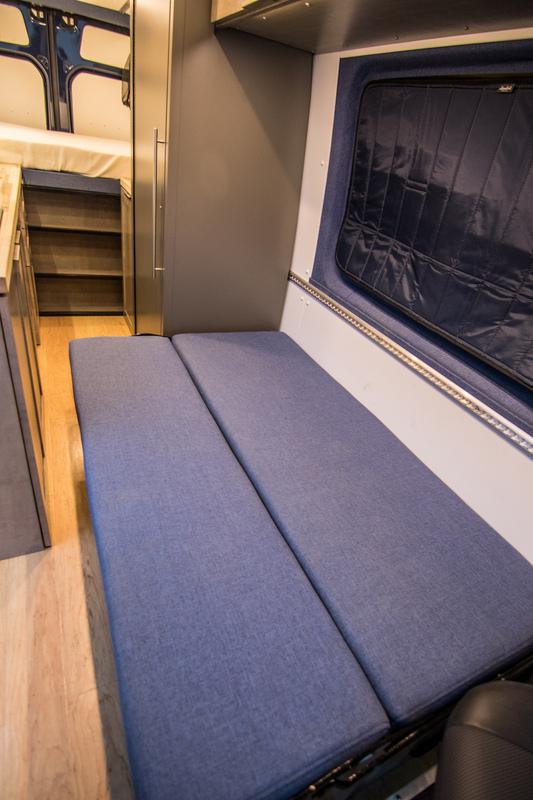 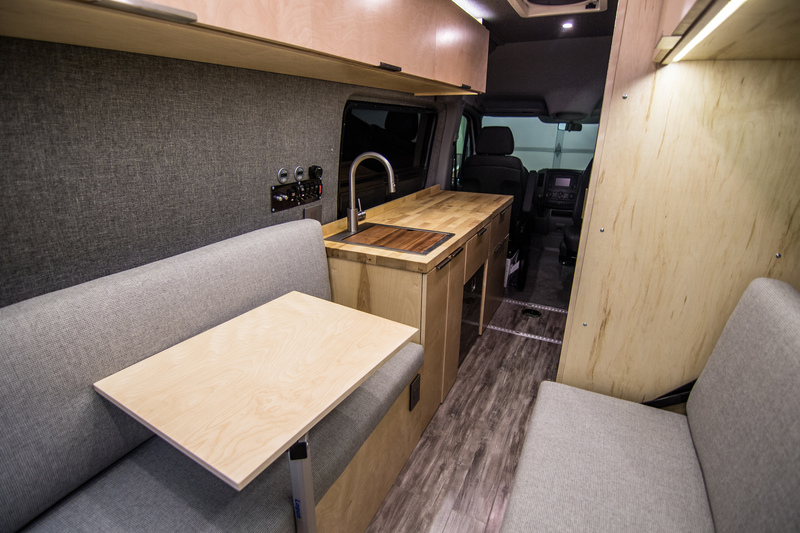 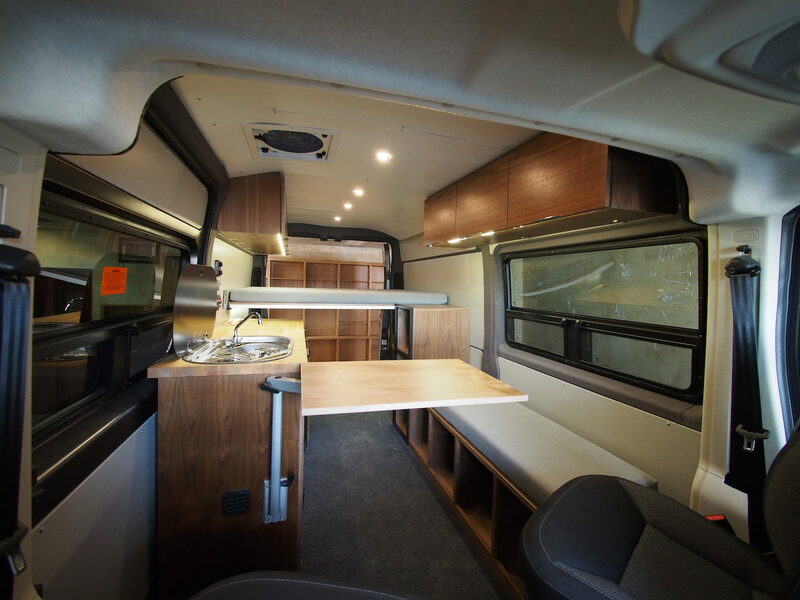 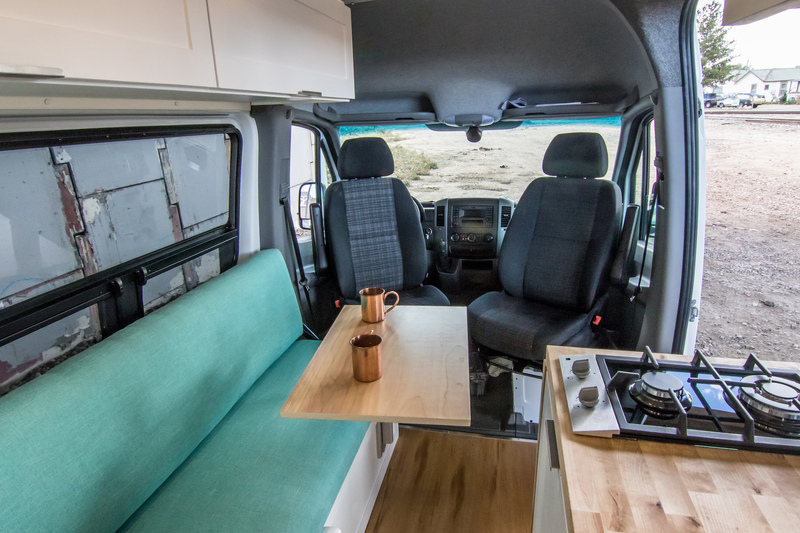 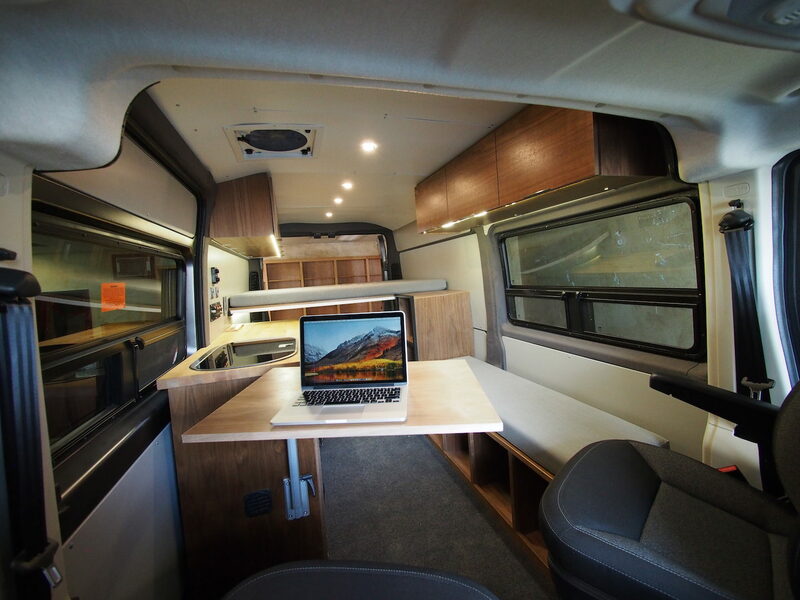 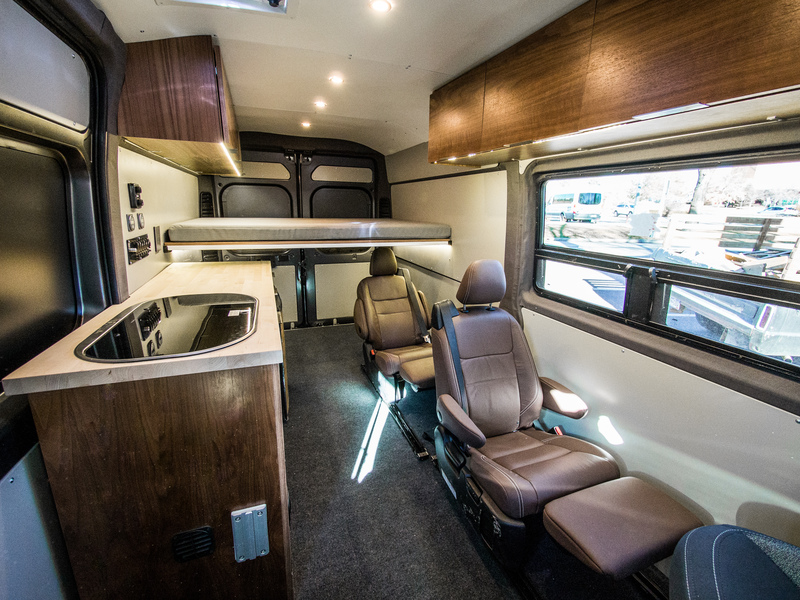 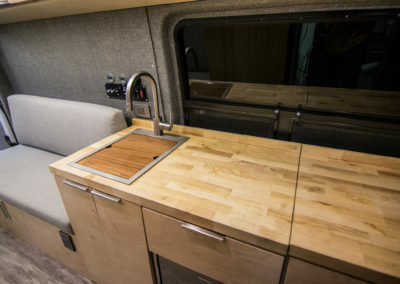 Solution:144″ Sprinter, custom upholstered bench, swivel seats, private bathroom, awning, and an outdoor serving table that doubles as a day bed. 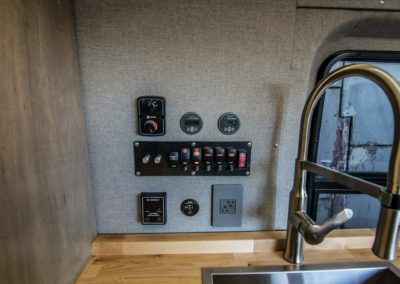 Story: Mike is a firefighter from New York City who was looking for an exciting alternative to a Brooklyn apartment. 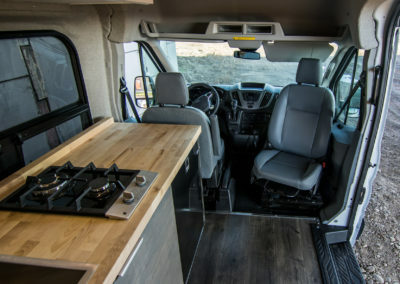 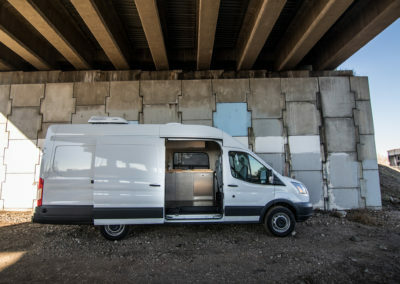 As a hunter and adventurer, vanlife is a great fit. 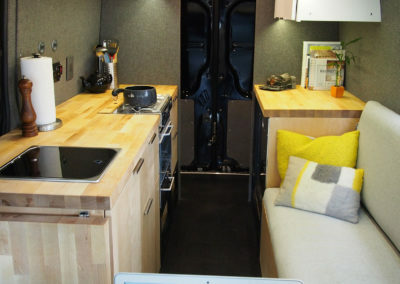 Goal: Comfortable full-time living quarters, modern design aesthetic, TONS of storage, residential grade comfort. Solution: Large sink, LED lights, concealed Nature’s Head toilet, large fridge, waterproof laminate flooring, and an exterior surf board rack. 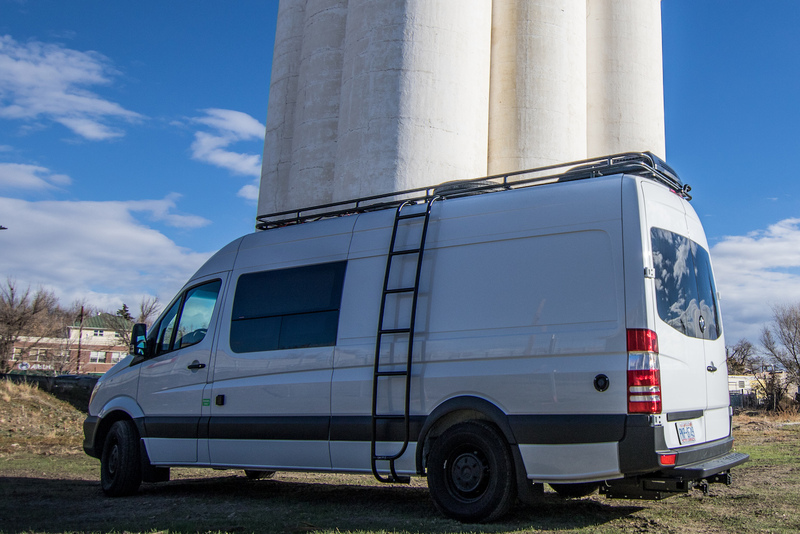 Story: Matt and Patty are excited to start the next chapter of their lives as they embark on an epic road trip. 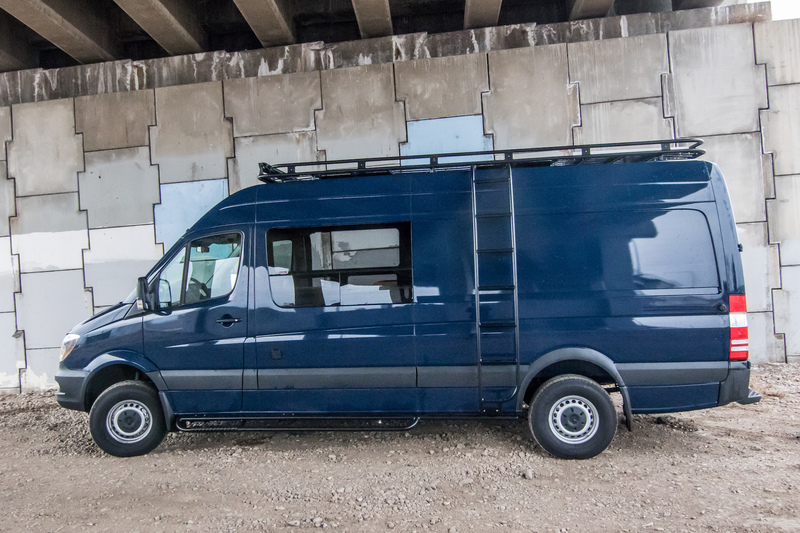 You can find this big blue van at trailheads and finish lines of ultra races. 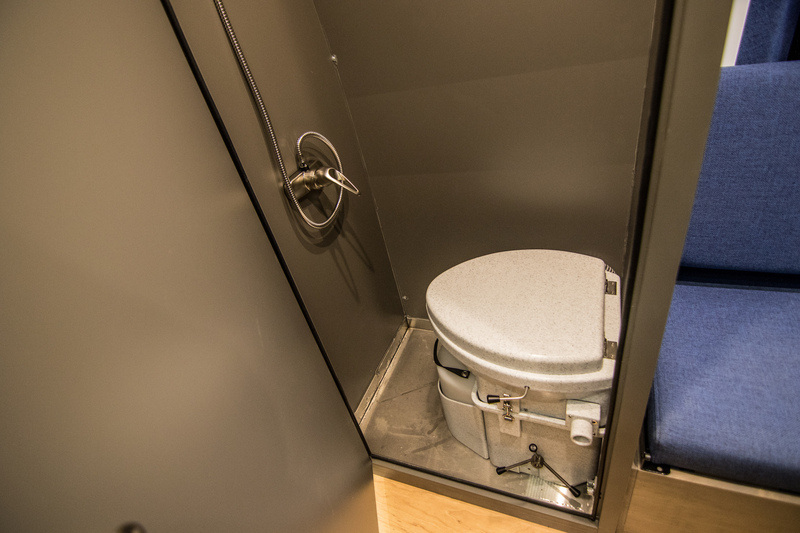 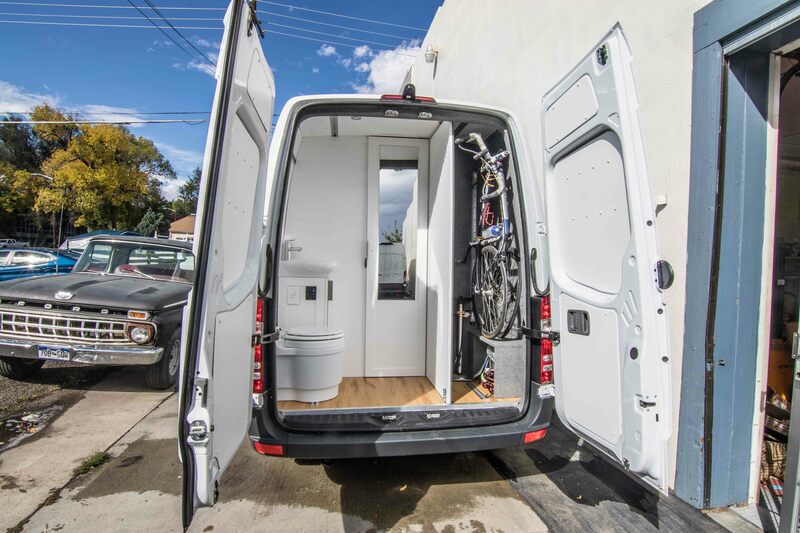 Goal: Indoor shower, room for the occasional house guest, large kitchen, extended off-grid capability. 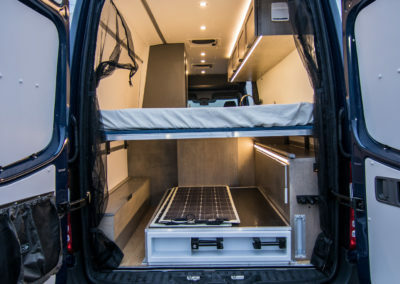 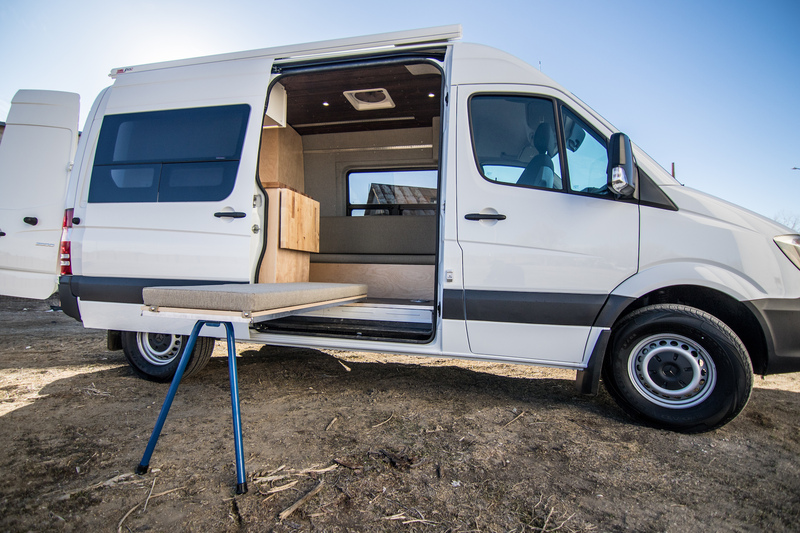 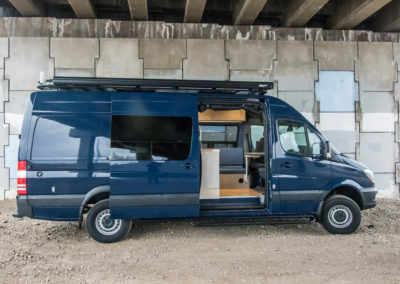 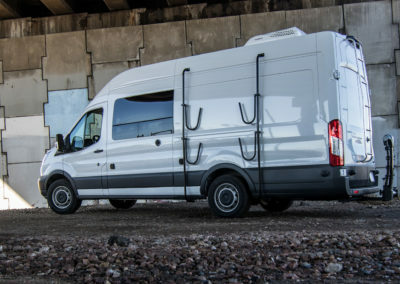 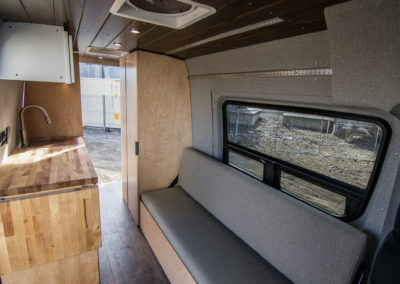 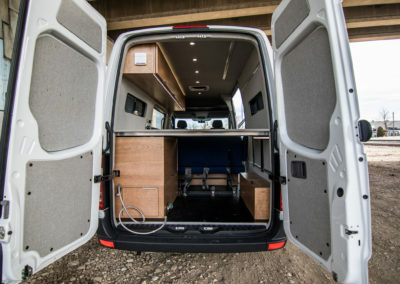 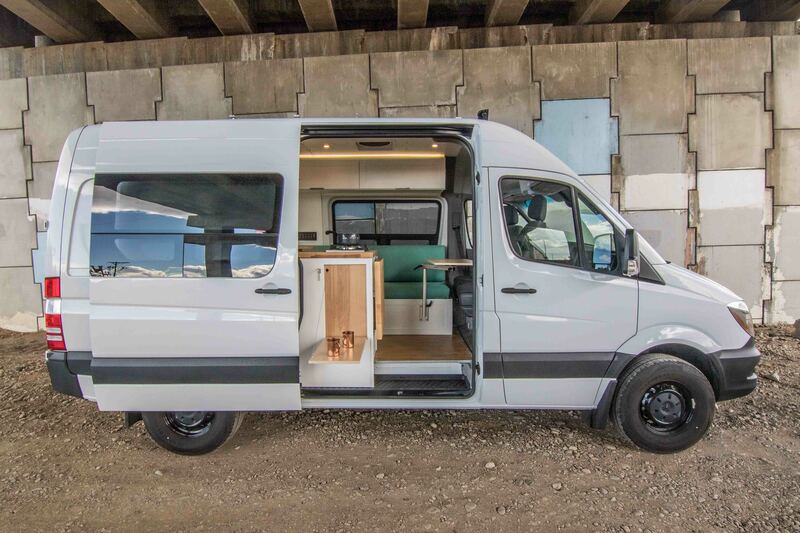 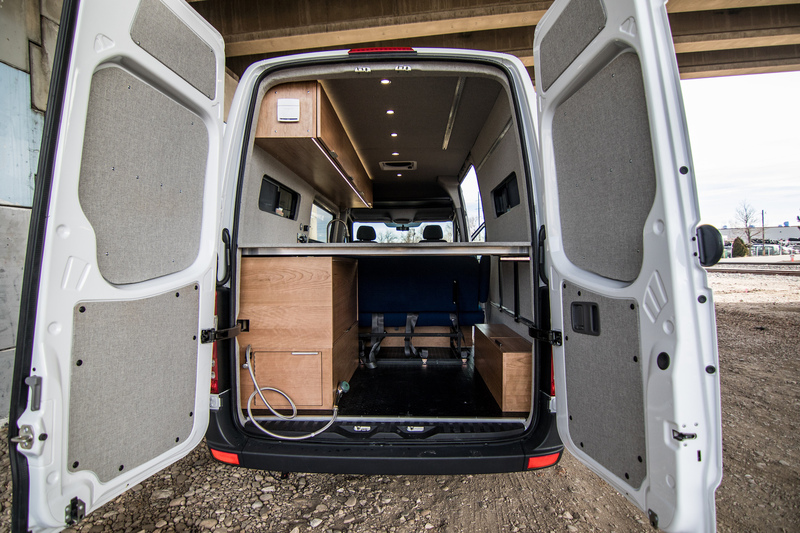 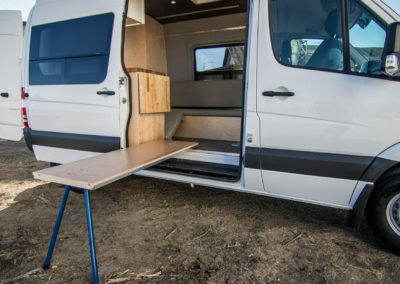 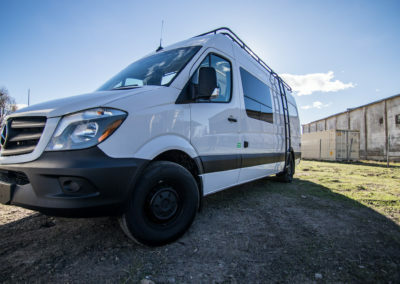 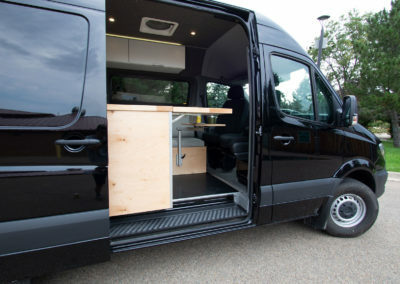 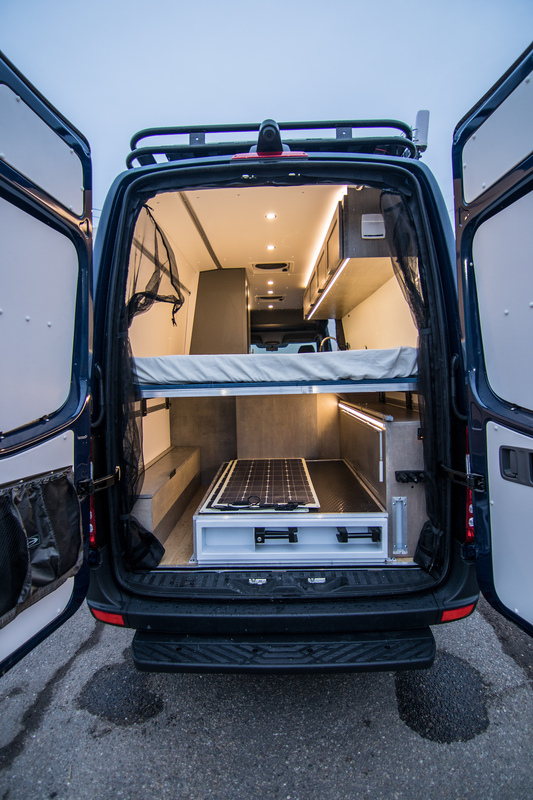 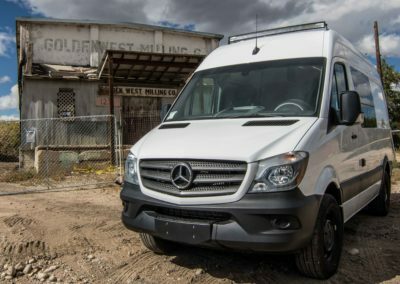 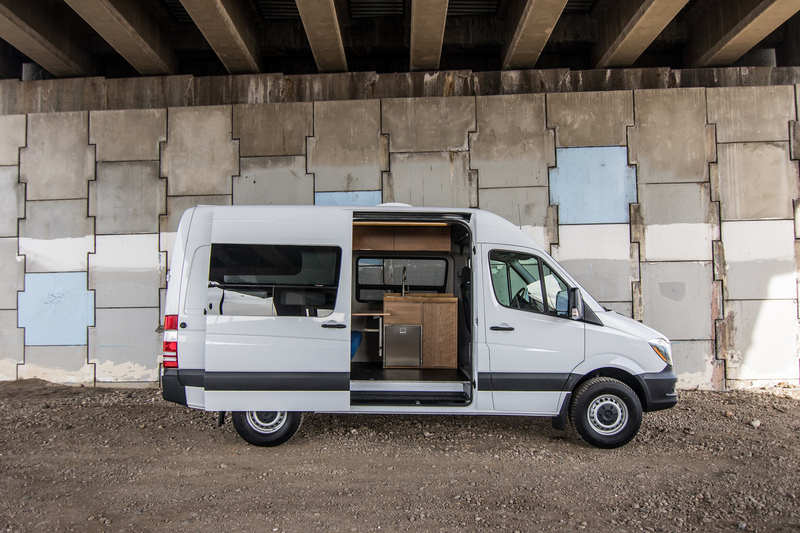 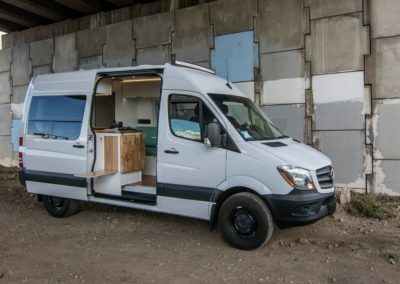 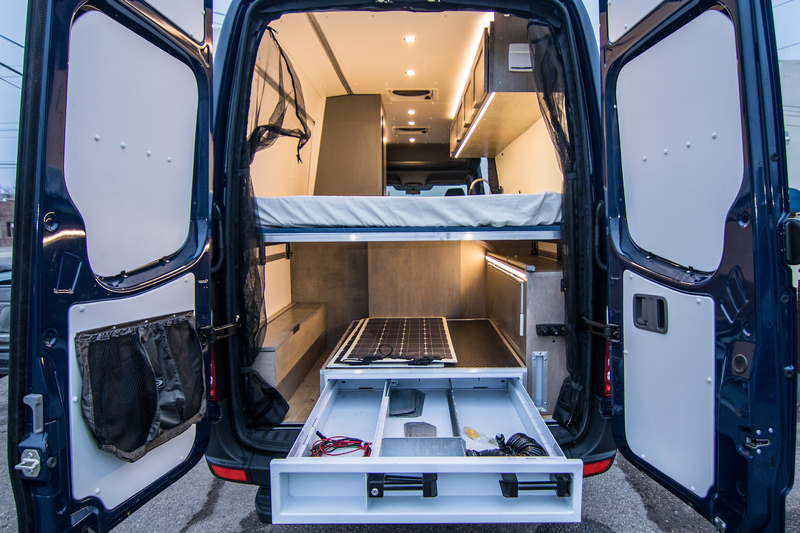 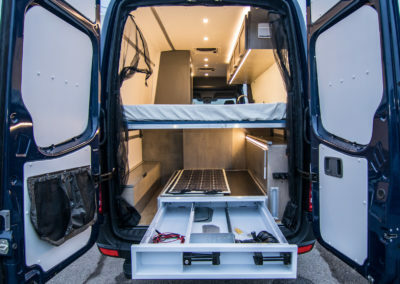 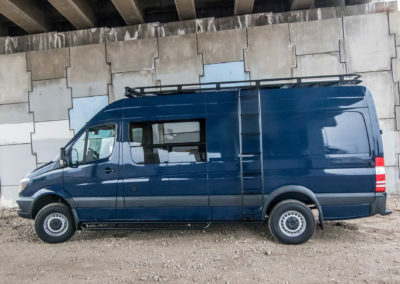 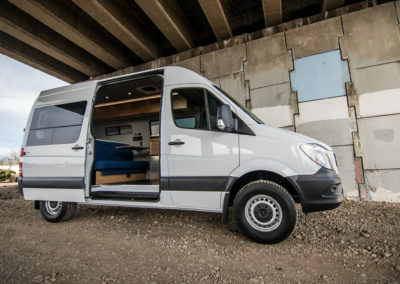 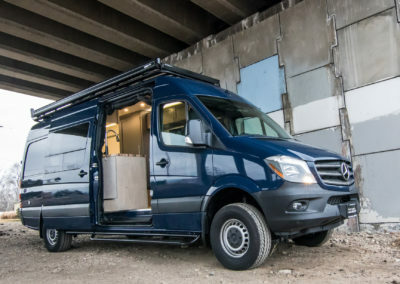 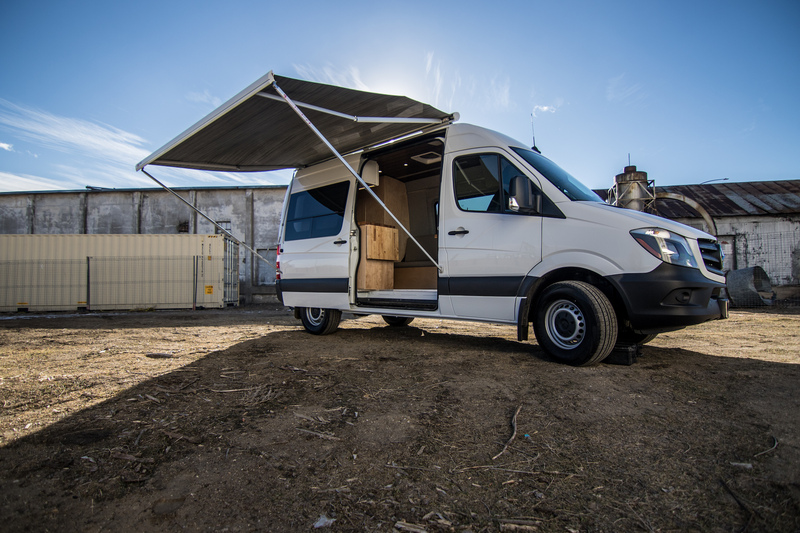 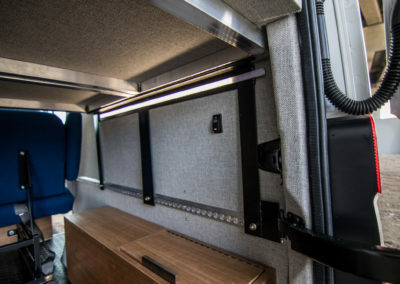 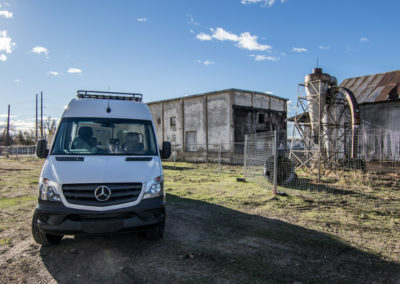 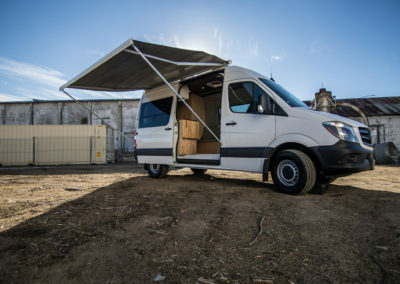 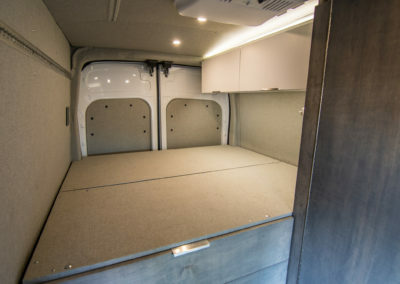 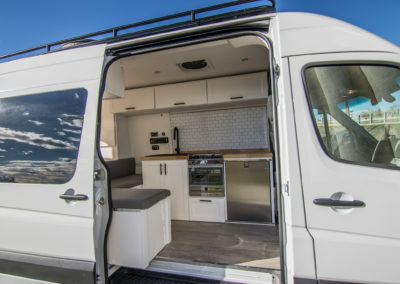 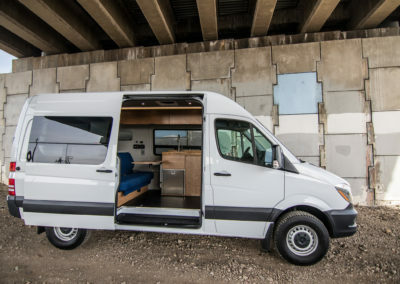 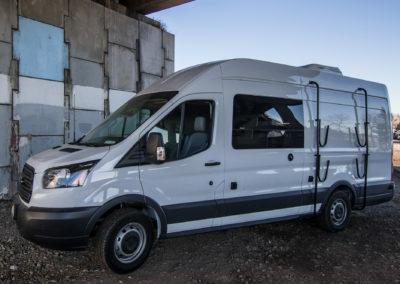 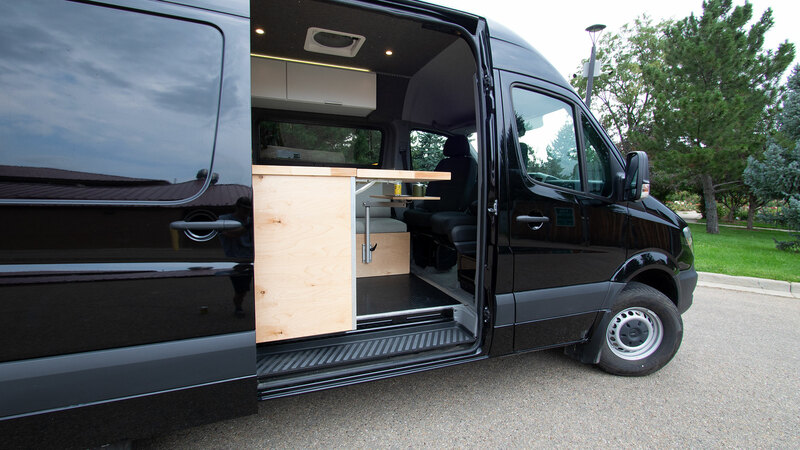 Solution: 170″ Sprinter, raised bed, indoor shower, convertable bench/guest bed, Aluminess roof rack, 400 watts of solar, and a large battery bank. 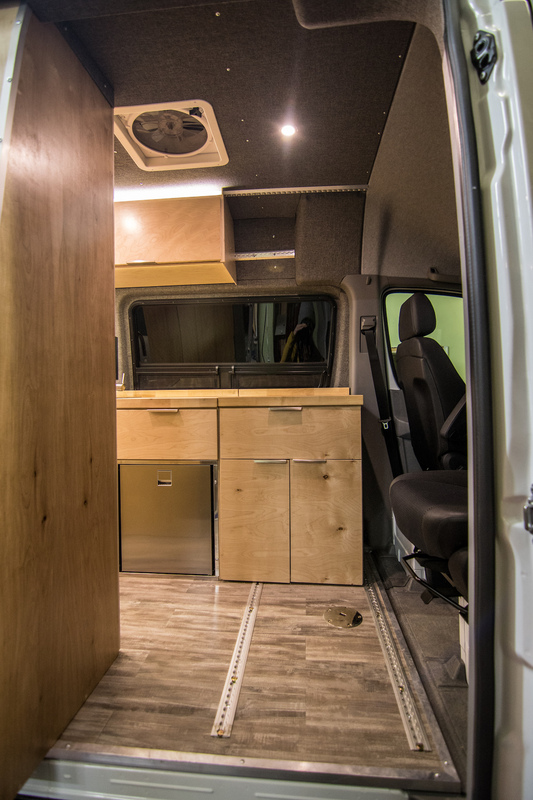 Story: Built for our adventurous clients Gretchen and Ken. 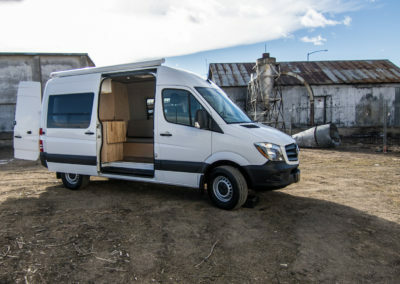 They reside in Montana but it would be hard to track them down, they are always out backpacking, camping, and enjoying the outdoors. 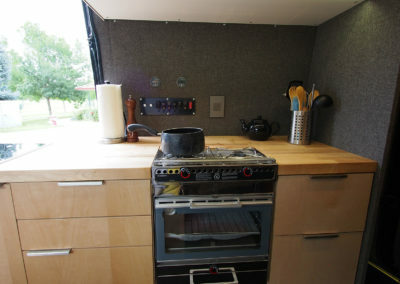 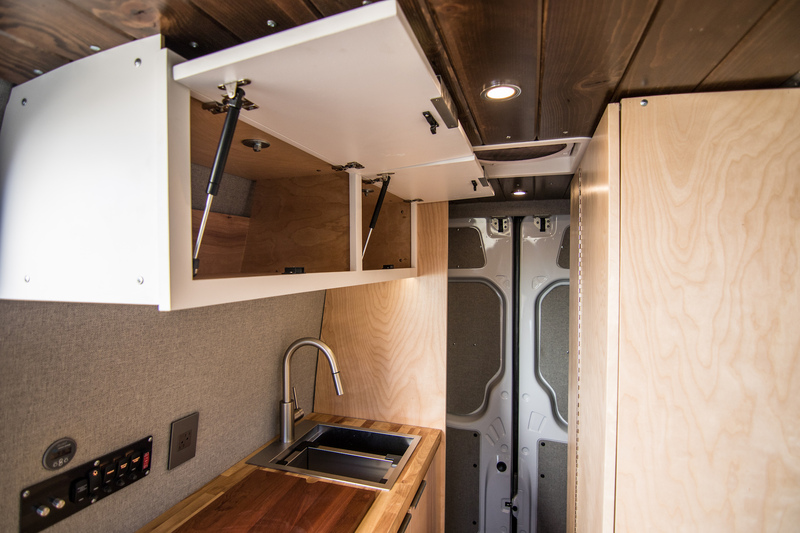 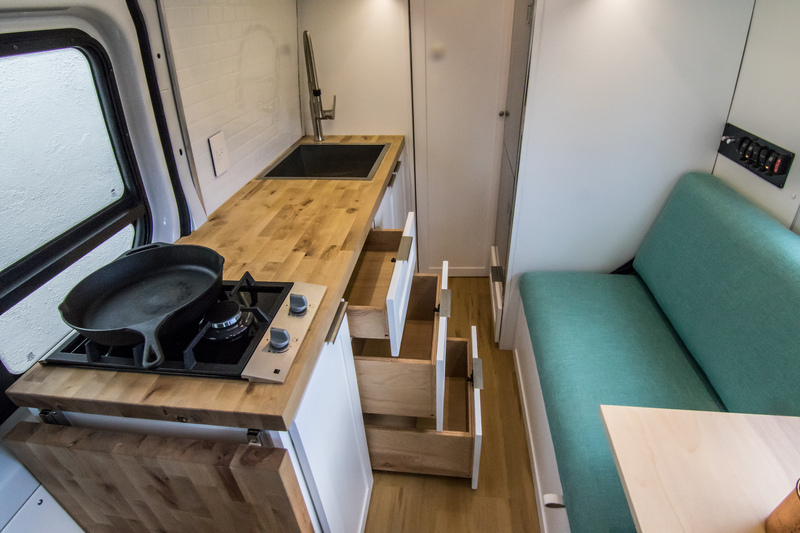 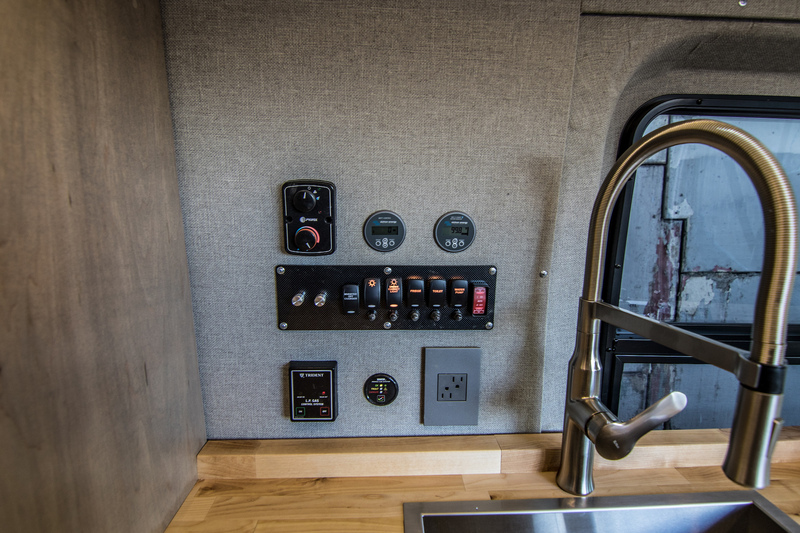 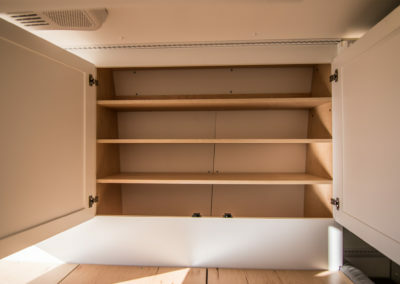 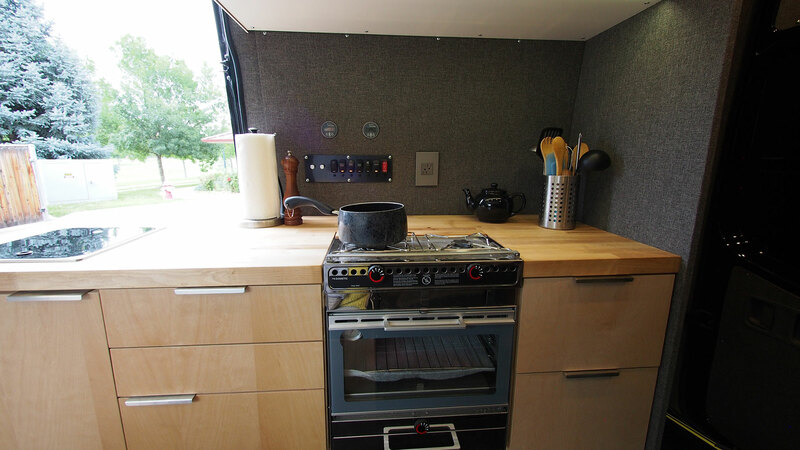 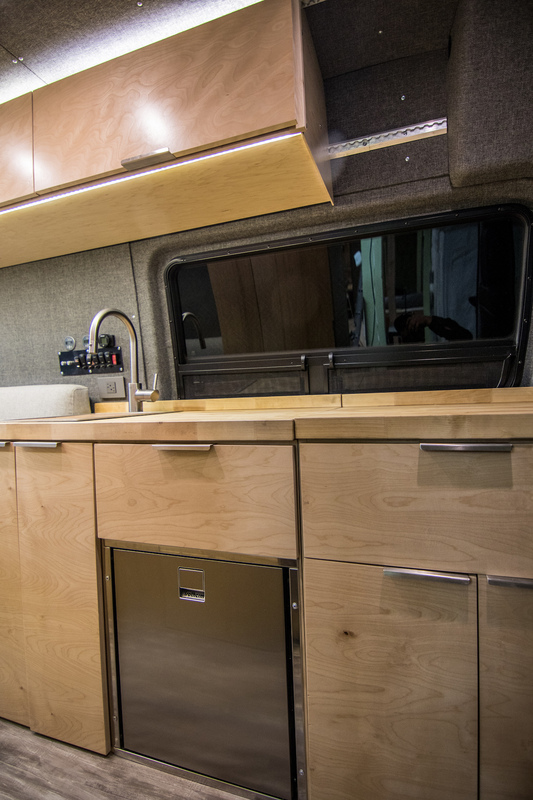 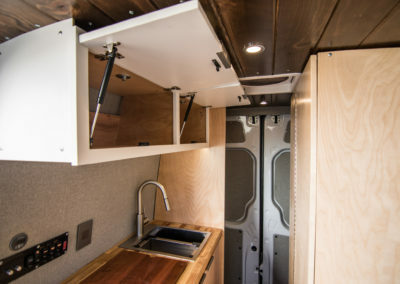 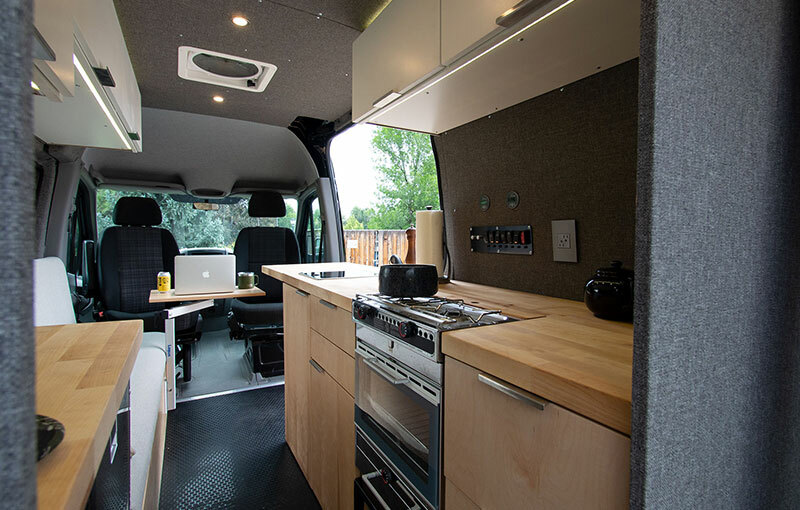 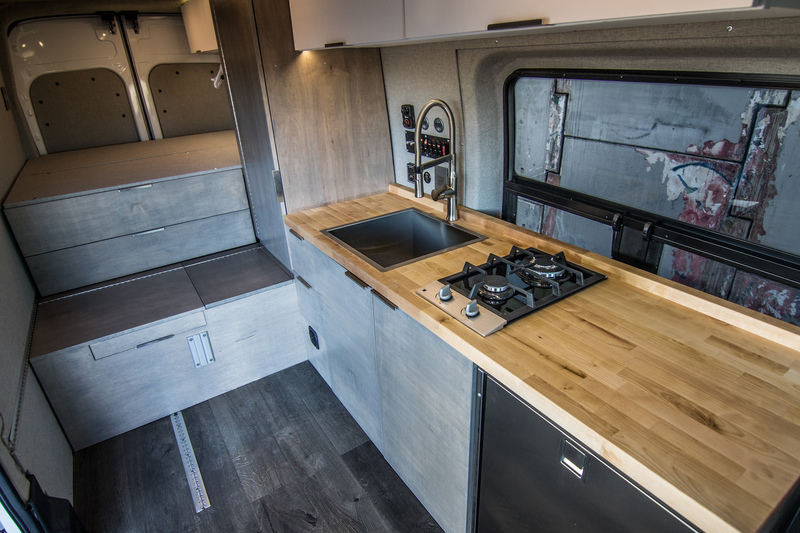 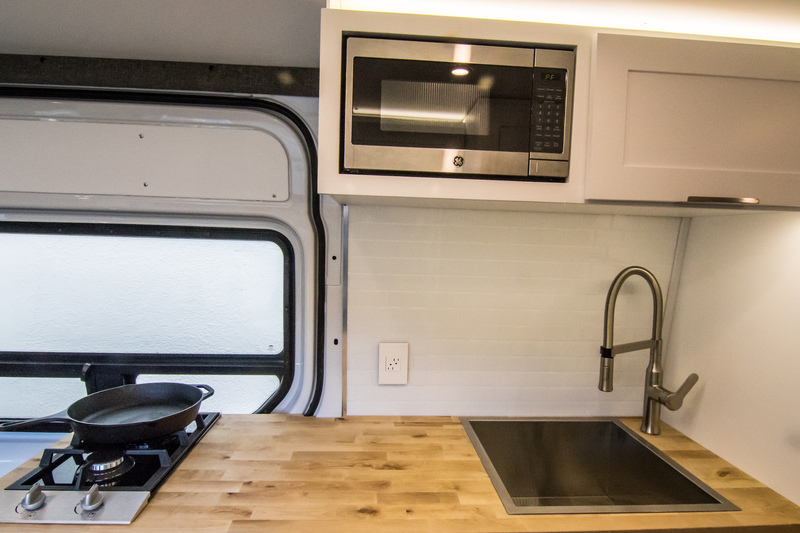 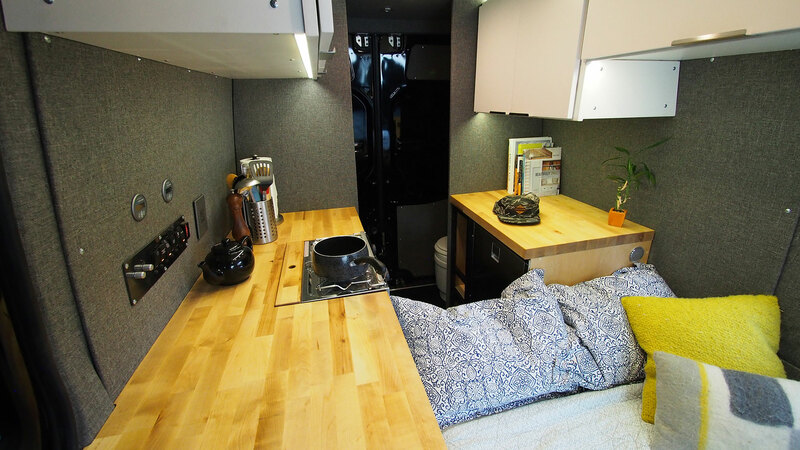 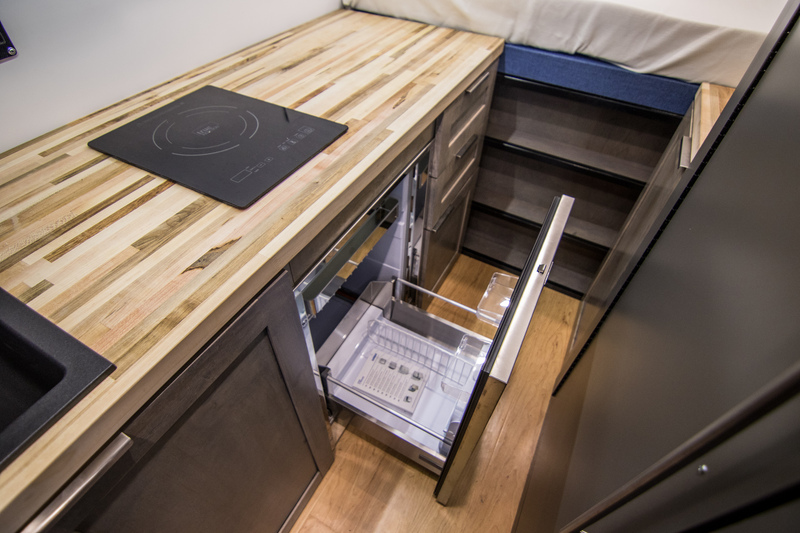 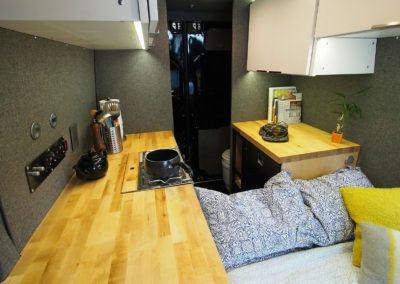 Goal: Gear storage, rugged, sleep two, comfortable kitchen. 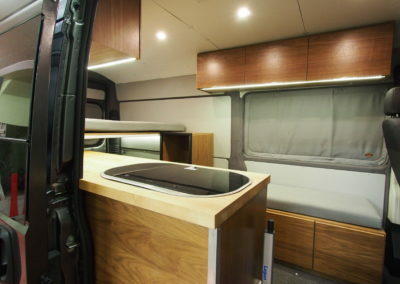 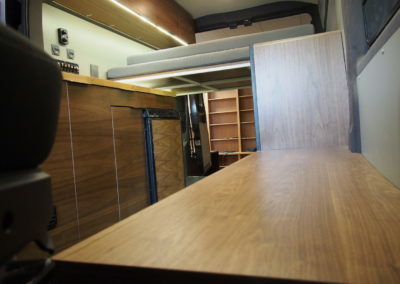 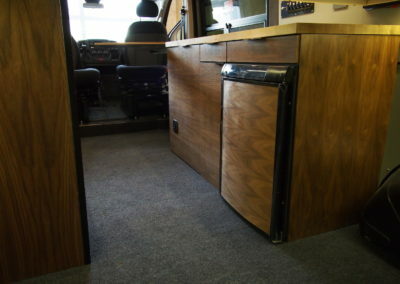 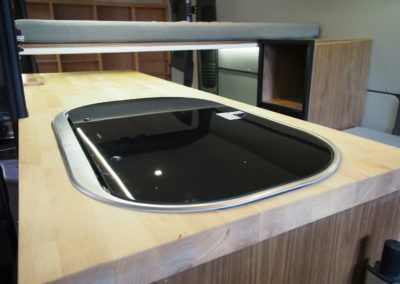 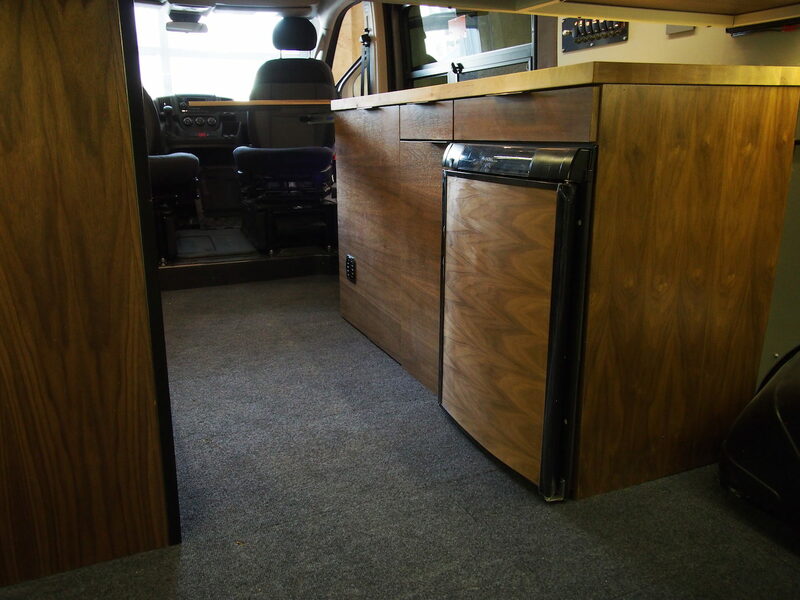 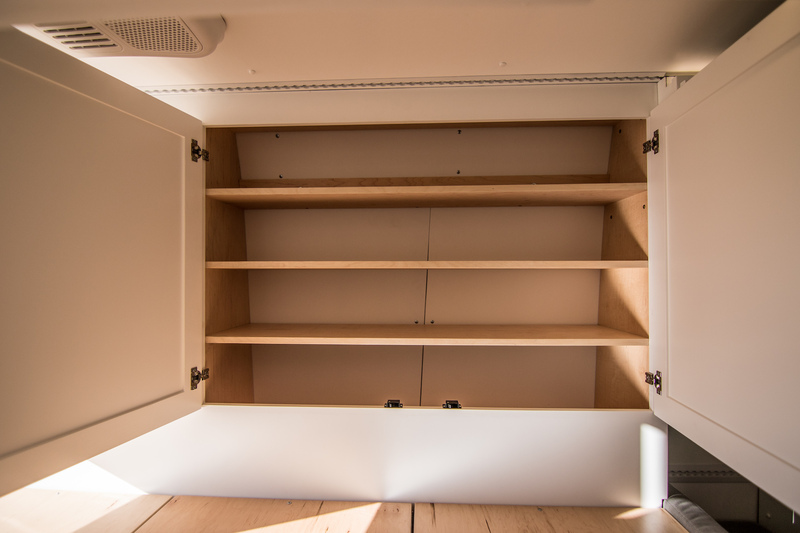 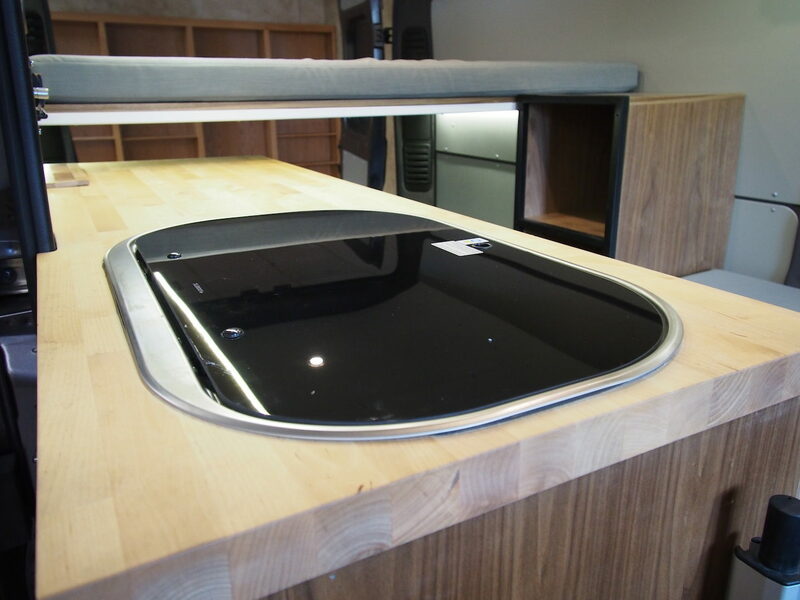 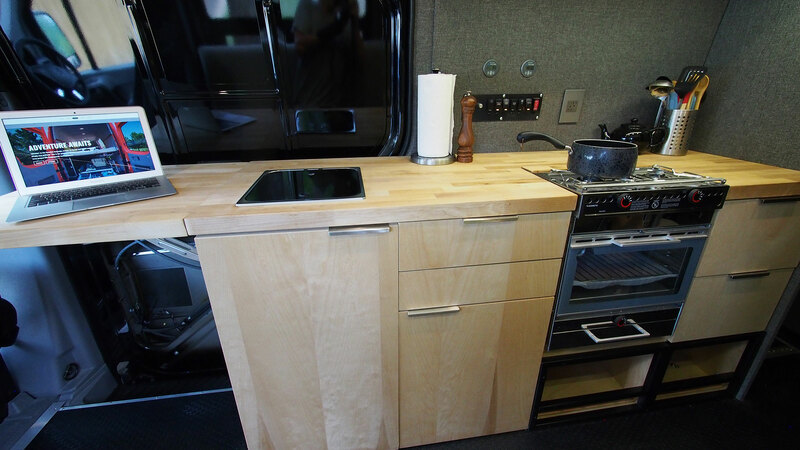 Solution: 159” Promaster, raised full bed, large galley, heater, lots of light, custom walnut cabinetry. 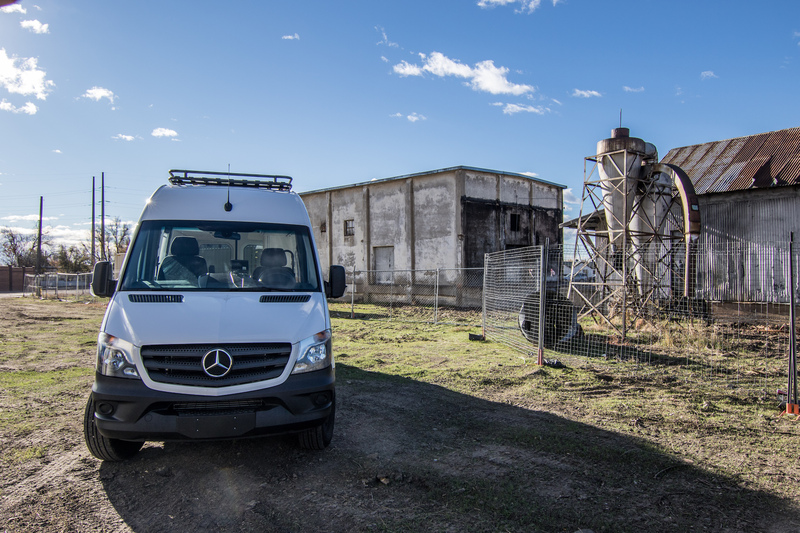 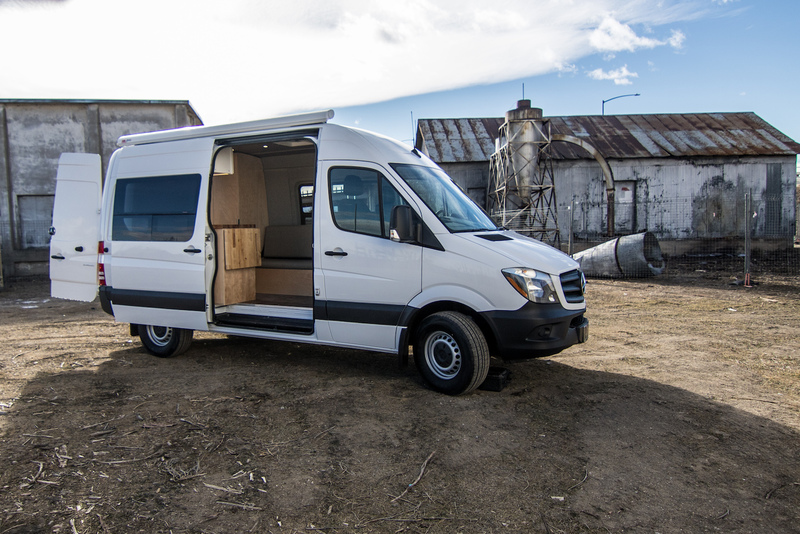 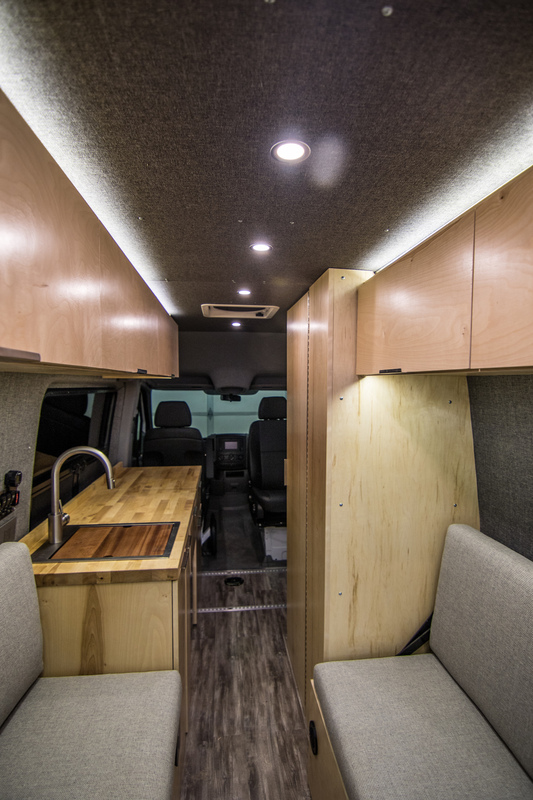 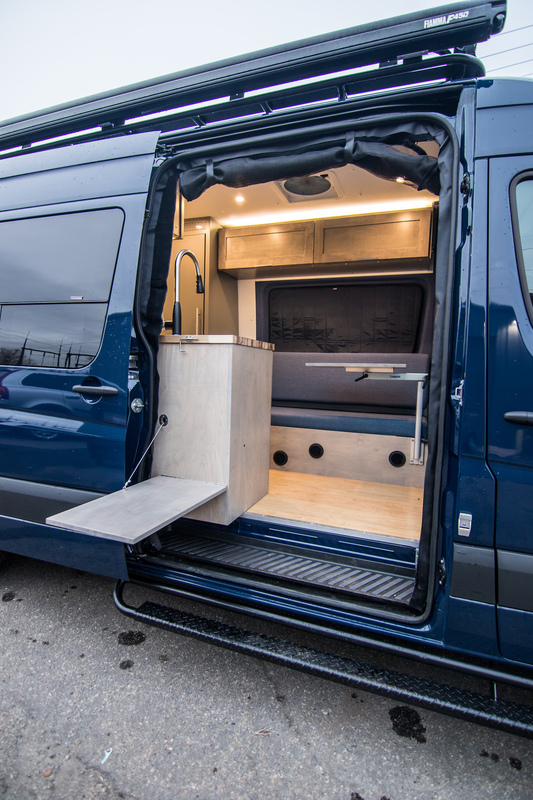 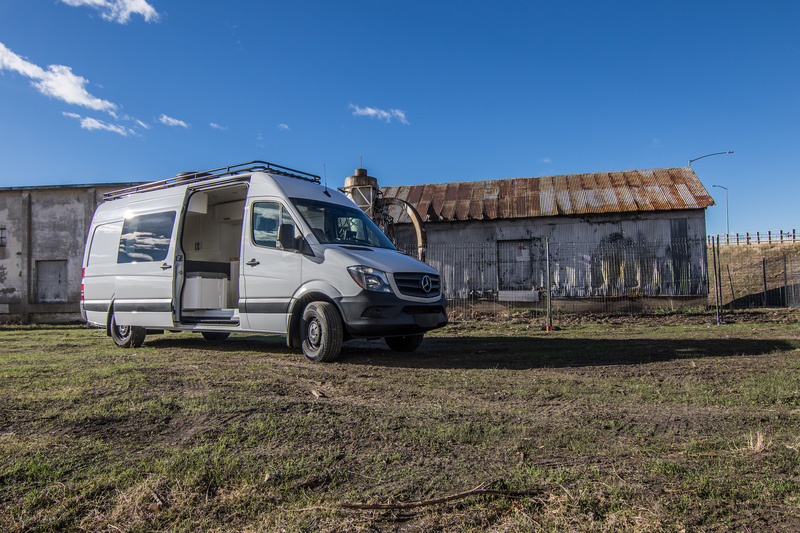 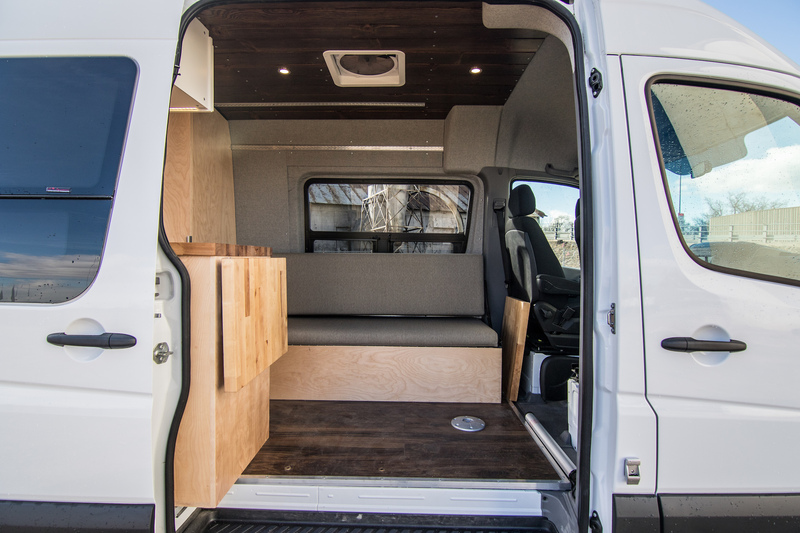 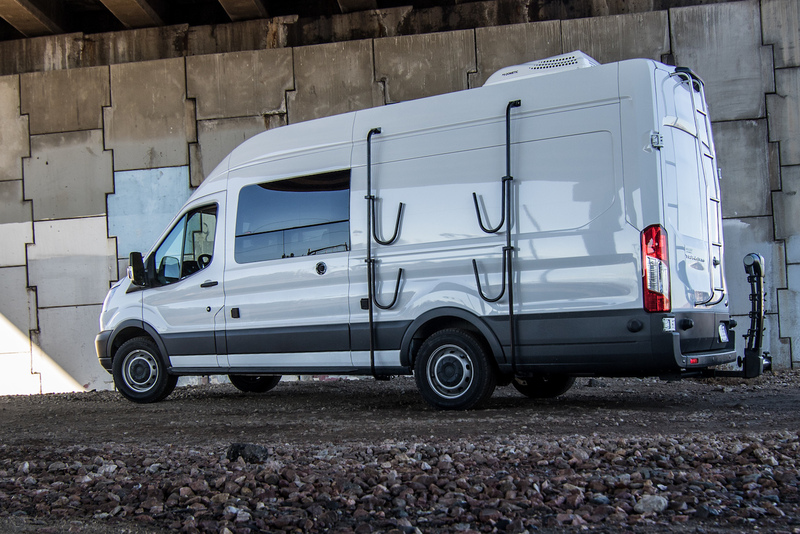 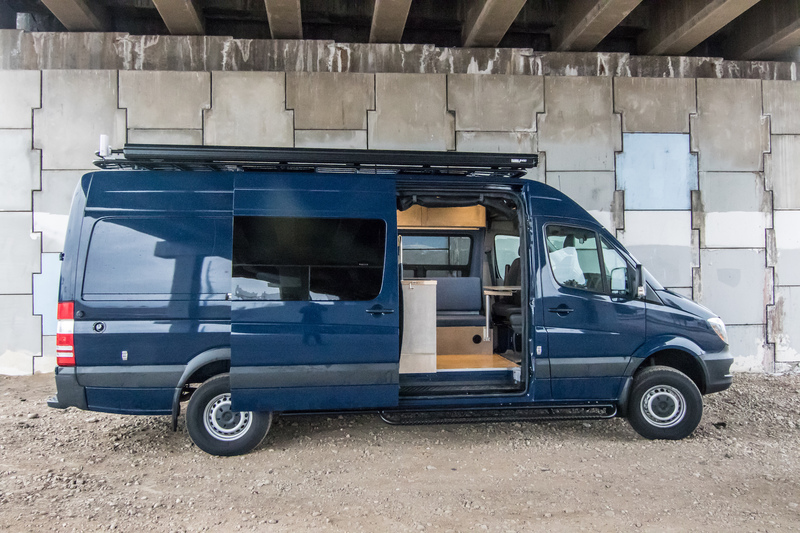 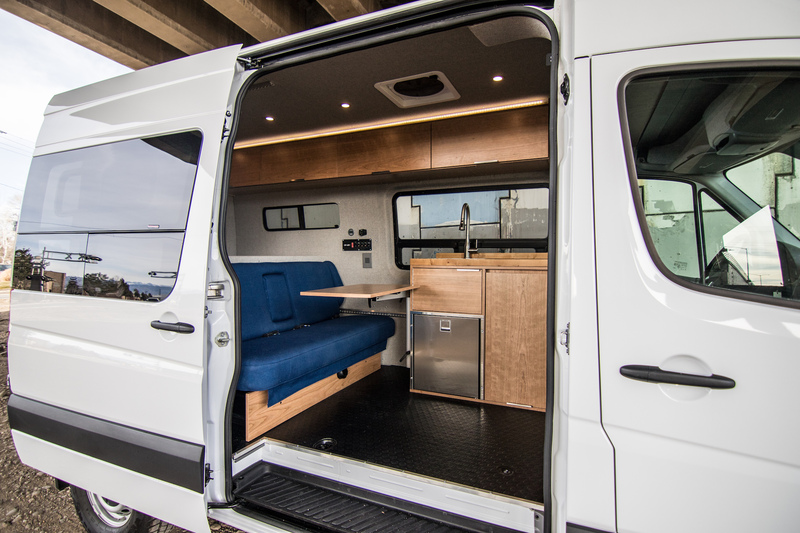 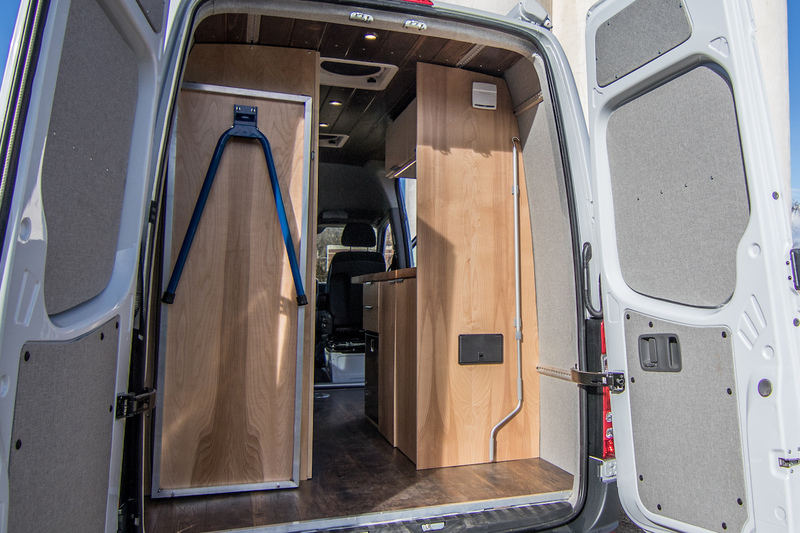 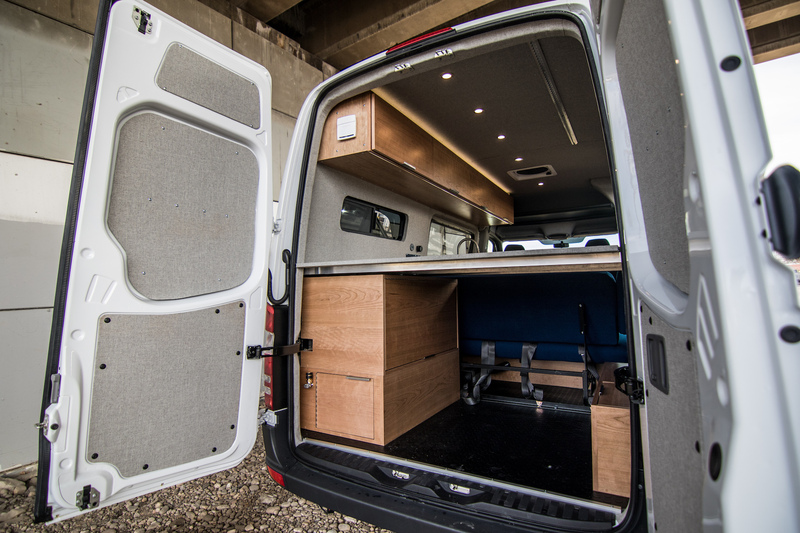 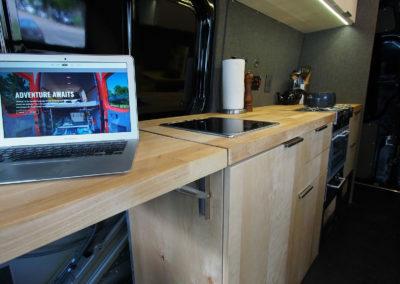 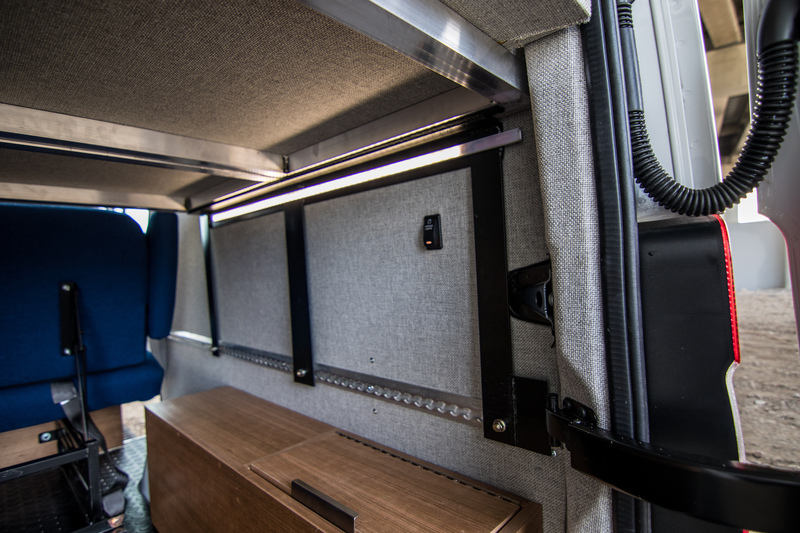 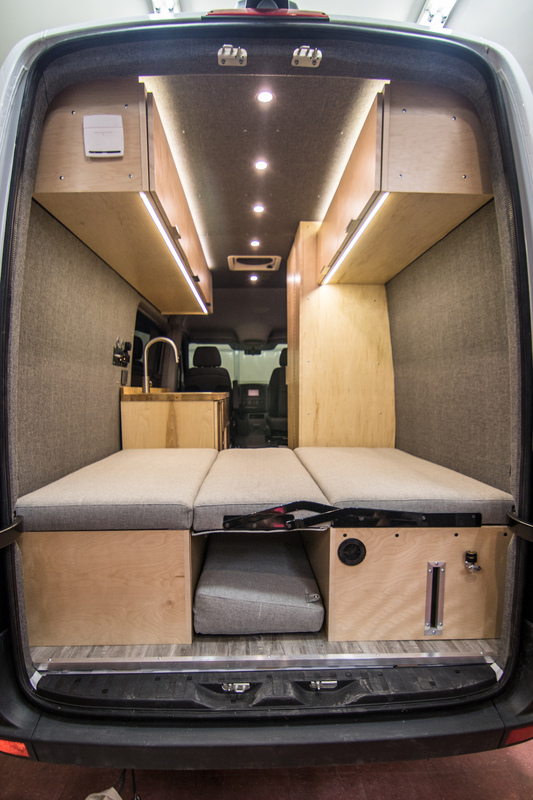 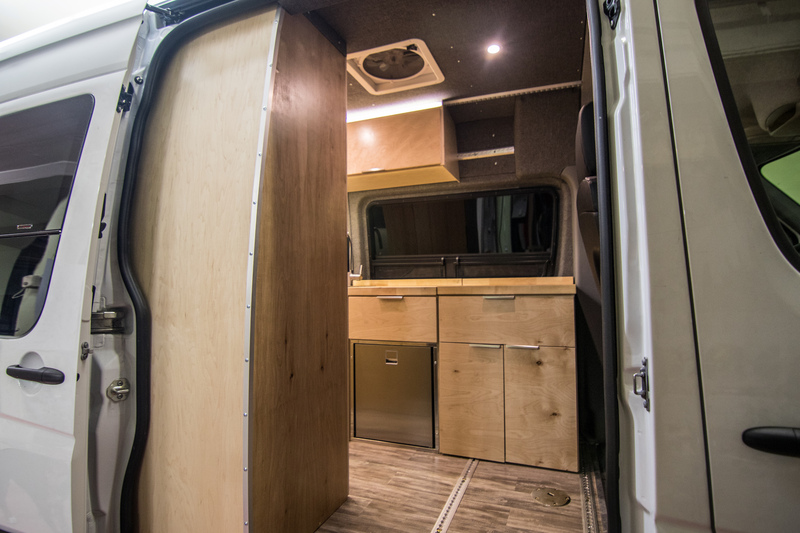 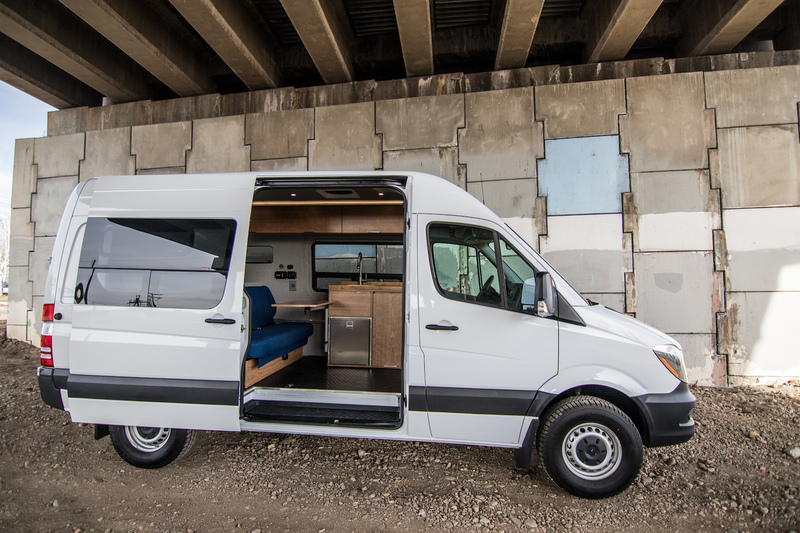 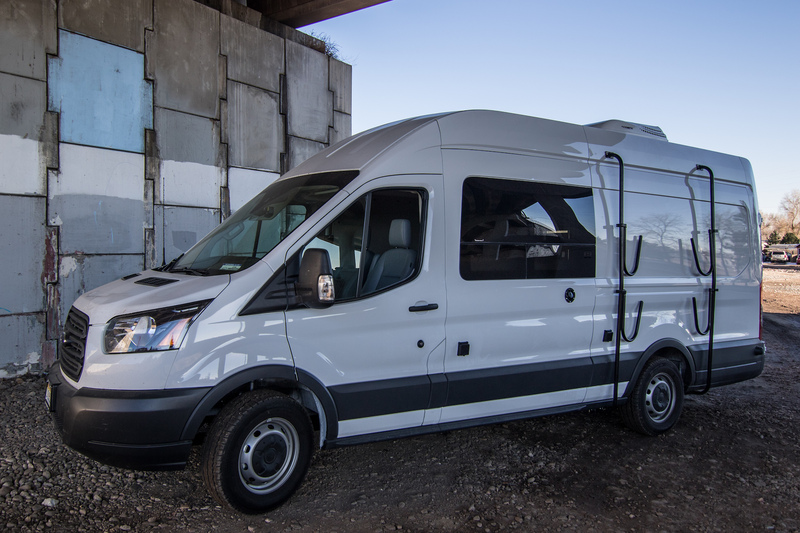 Story: We built this van for Field Trip Outfitters, a van rental service based out of California. 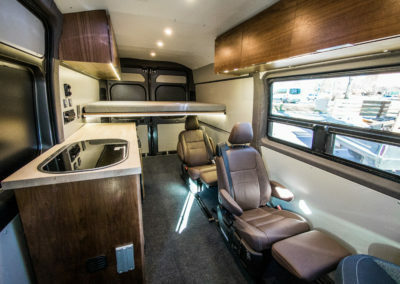 Check them out if you want to spend a weekend in this comfortable and capable rig! 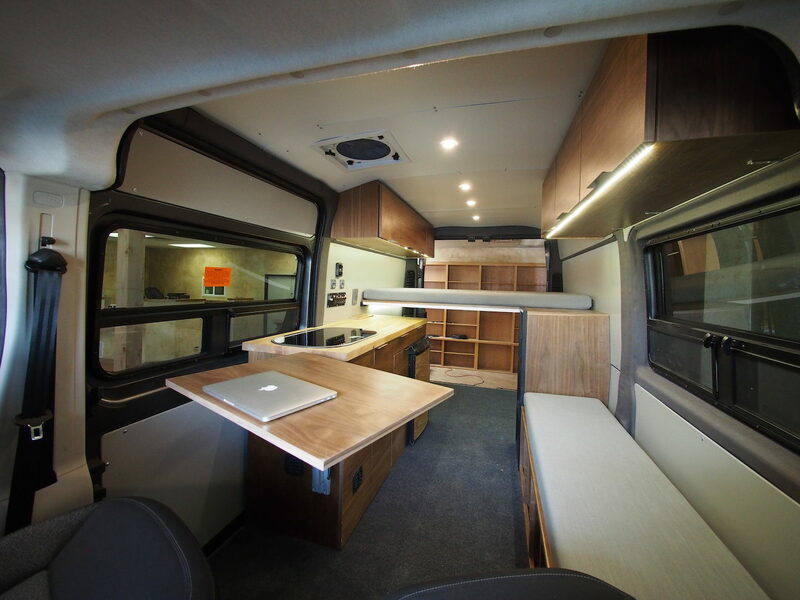 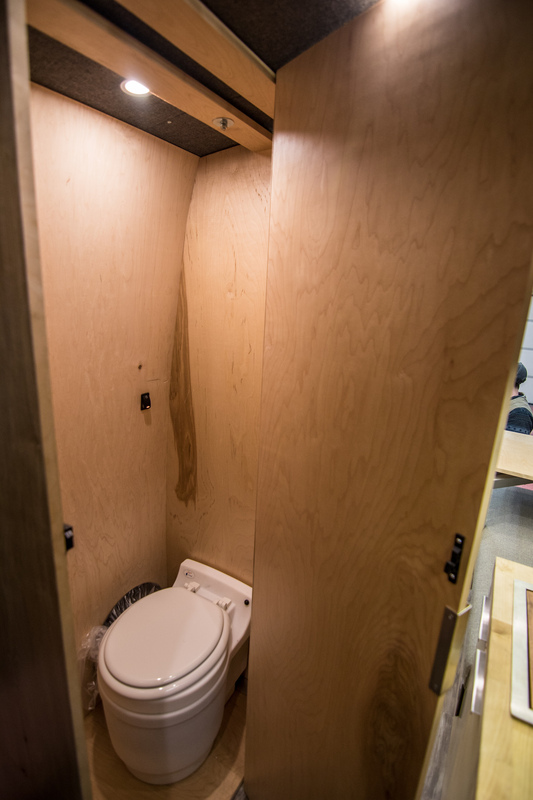 Goal: Versatile configuration for a variety of users, open floor plan, indoor bathroom, and an exterior shower. 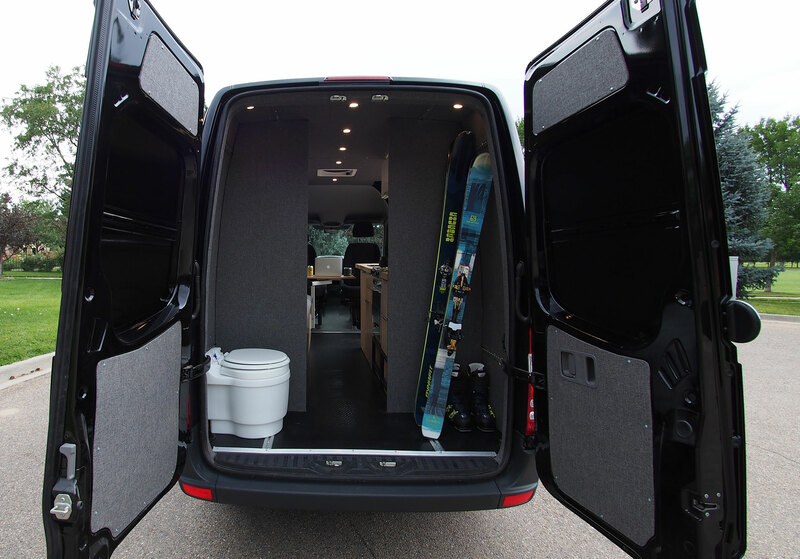 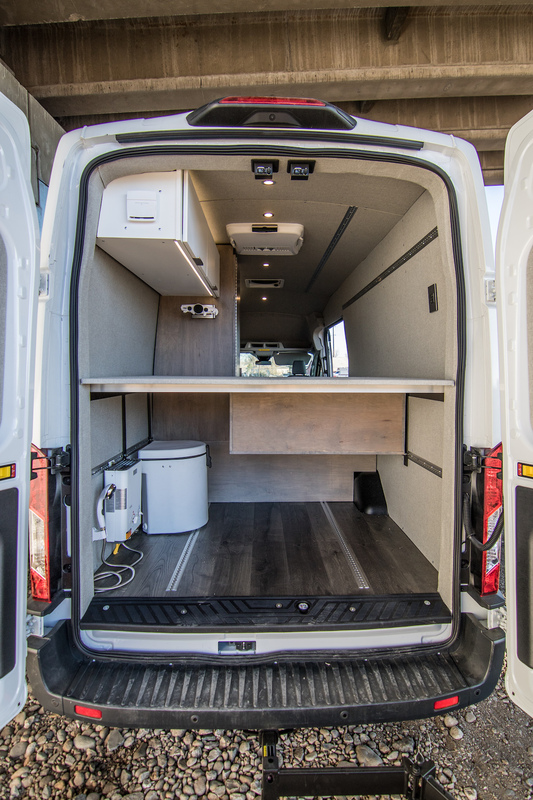 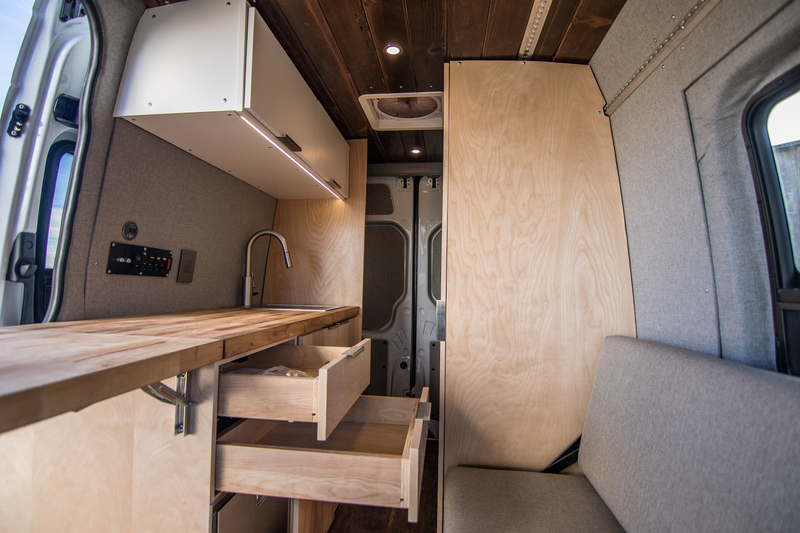 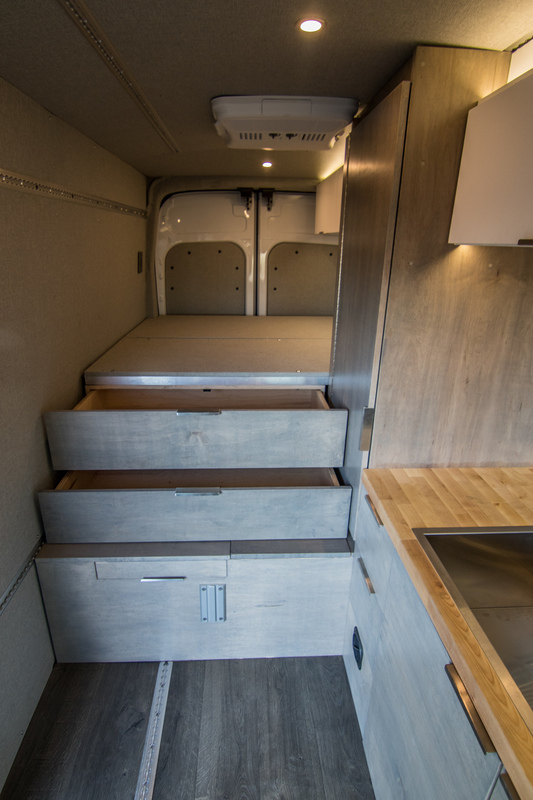 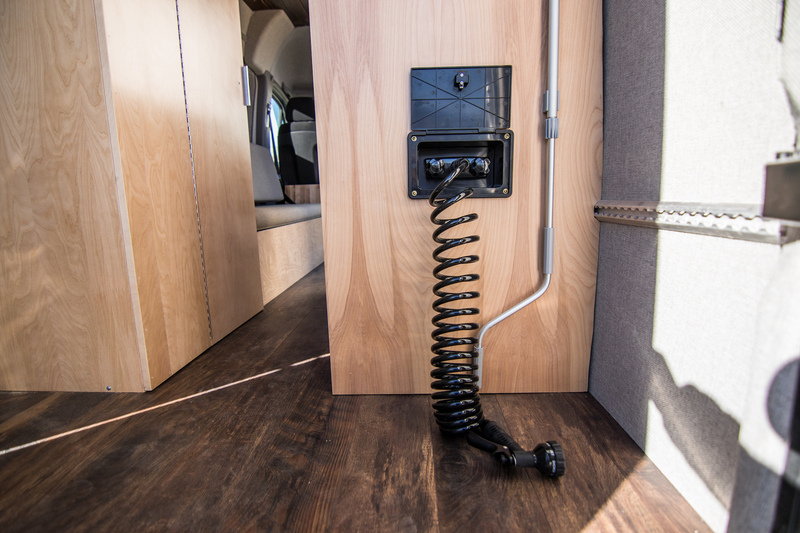 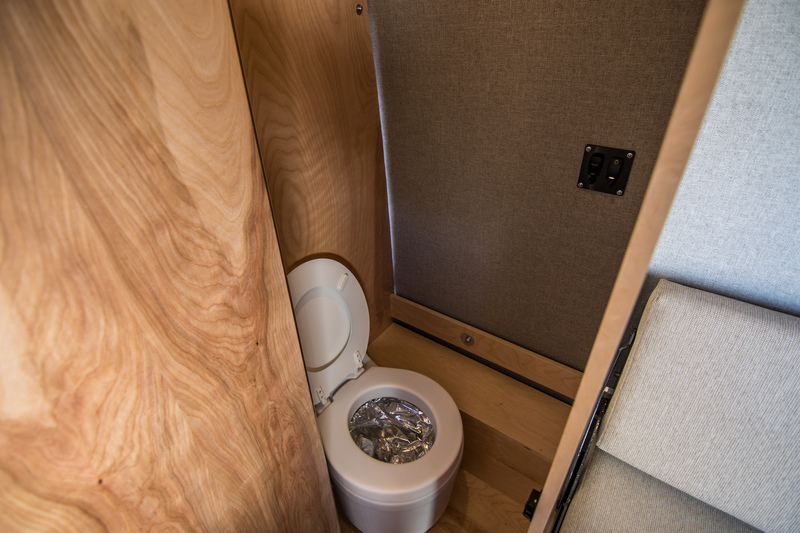 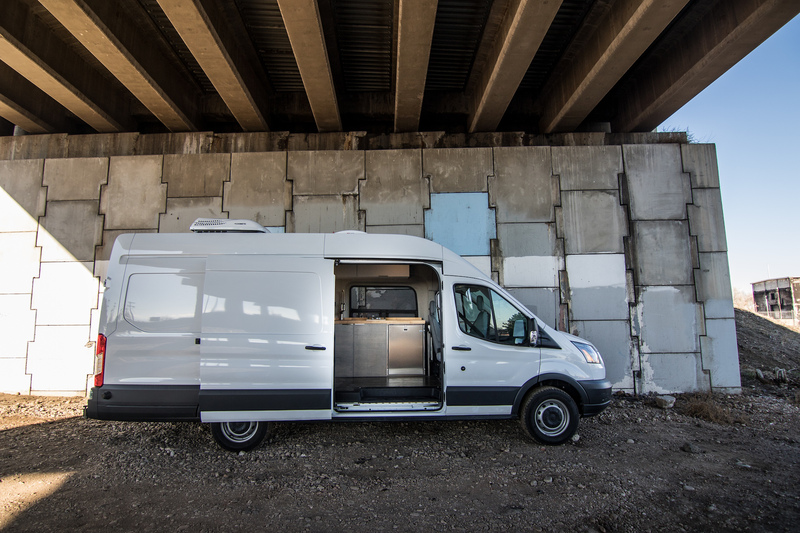 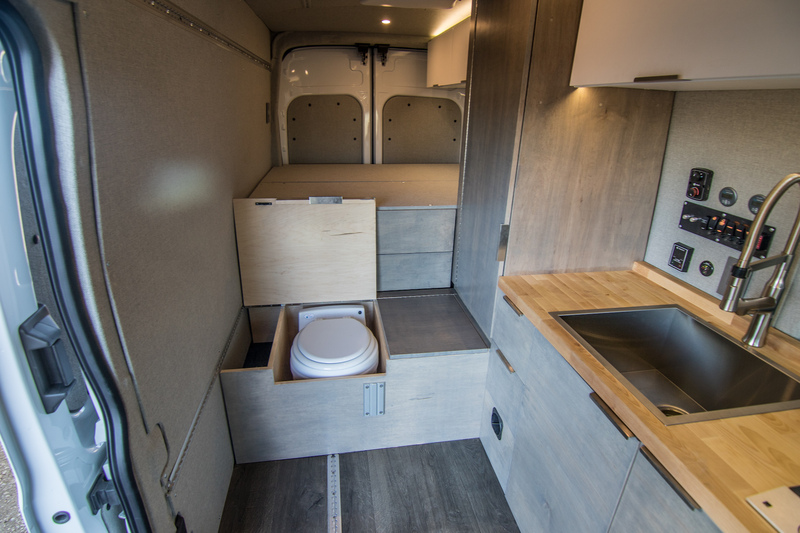 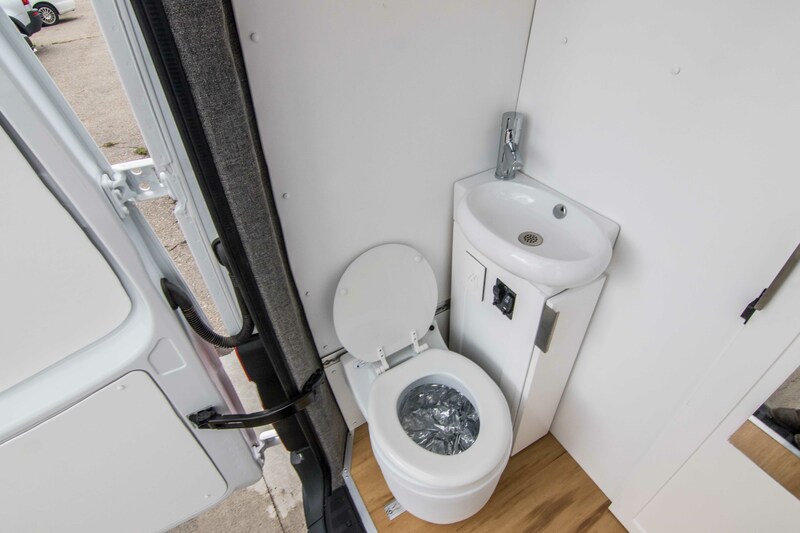 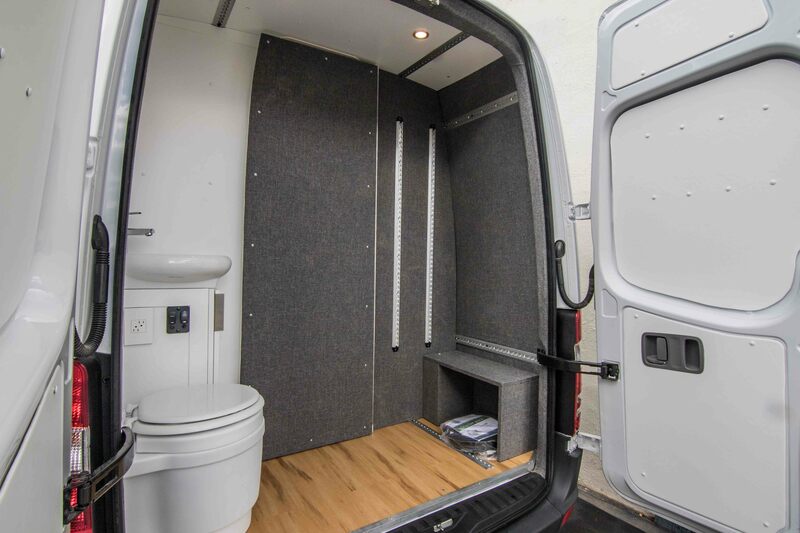 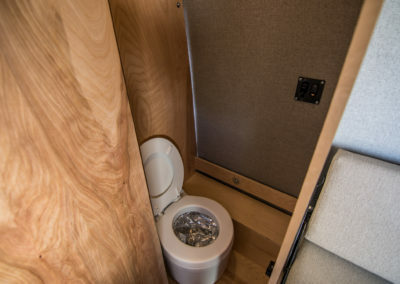 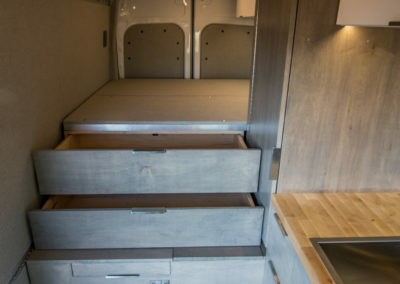 Solution: 4x4 144″ Sprinter, dinette bed system at the rear, removable cabinetry, removable second row seats, and a Dry Flush toilet.